During this holiday I intended to continue a backpacking “project” I had started almost a year ago, and that I was hoping to complete this time! I drove down to Fort William, arrived there at 09:00 and parked, once again, by the phone box beside the Youth Hostel in Glen Nevis. I caught the 09:16 Stagecoach bus No. 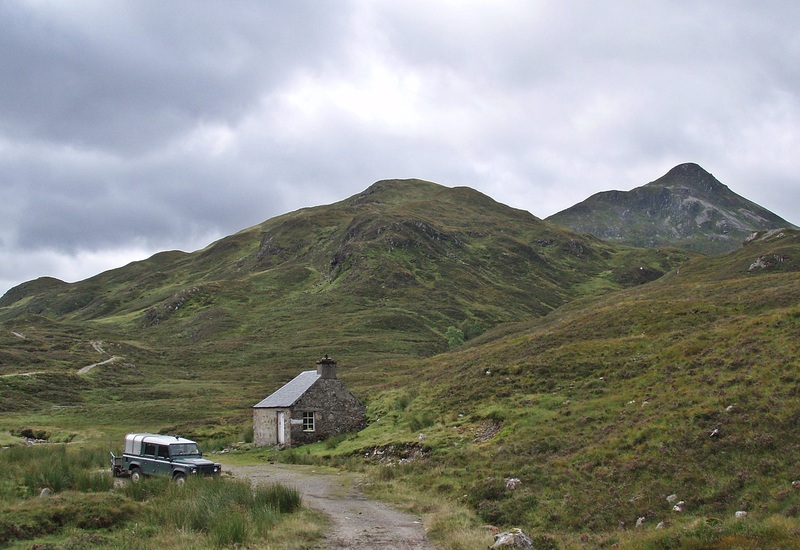 41 which was already waiting in front of the hostel, and a few minutes down the road a large crowd of passengers boarded the bus at the Glen Nevis campsite – the bus was now packed and I offered my seat to an elderly lady. In the town centre, outside Nevisport, I changed to Stagecoach No. 44 to Kinlochleven, where I arrived at 10:40. It was sunny and warm as I walked up the steep path signposted to Loch Eilde Mòr, but a drizzly shower started just as I was about to leave the shelter of the trees. I stopped for a break and a bite to eat under the last tree, and when I continued on my way up, the wind had picked up and it didn’t feel quite so warm any more. 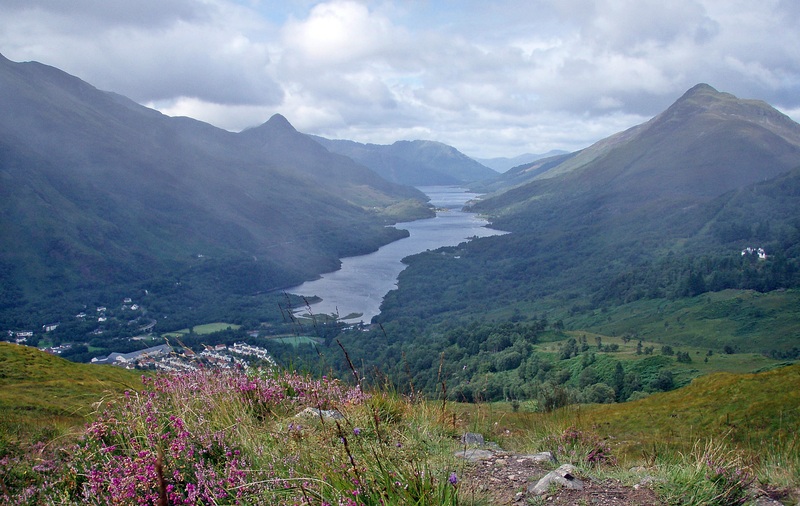 View back down to Loch Leven. 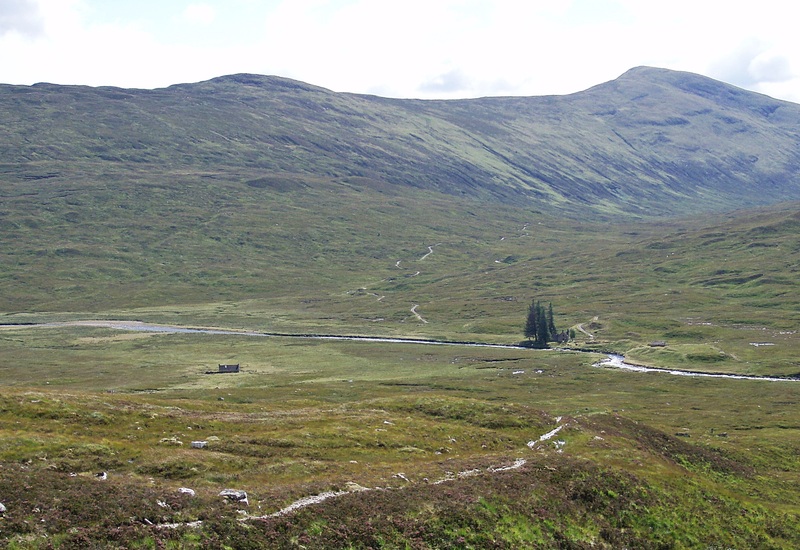 I crossed the track leading to Loch Eilde Mòr and continued on the path to Coire an Lochain. 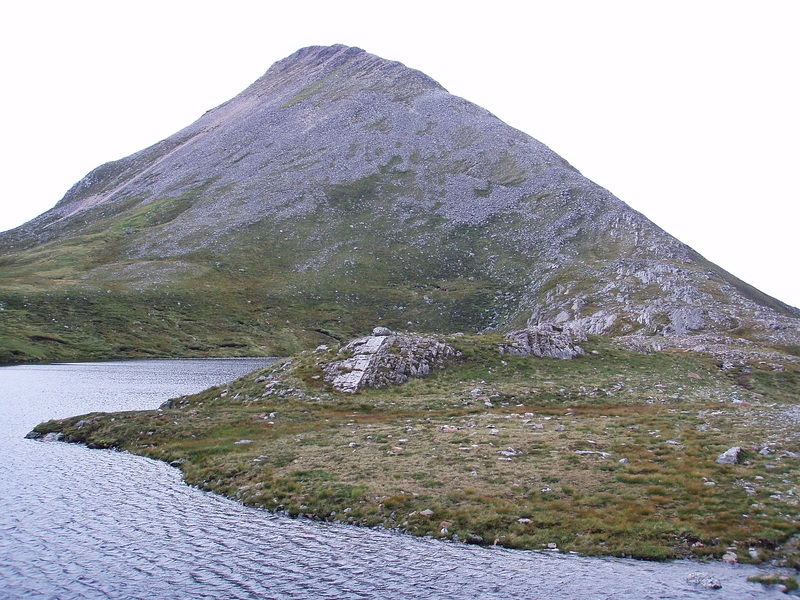 Na Gruagaichean towering above Coire nan Laogh. 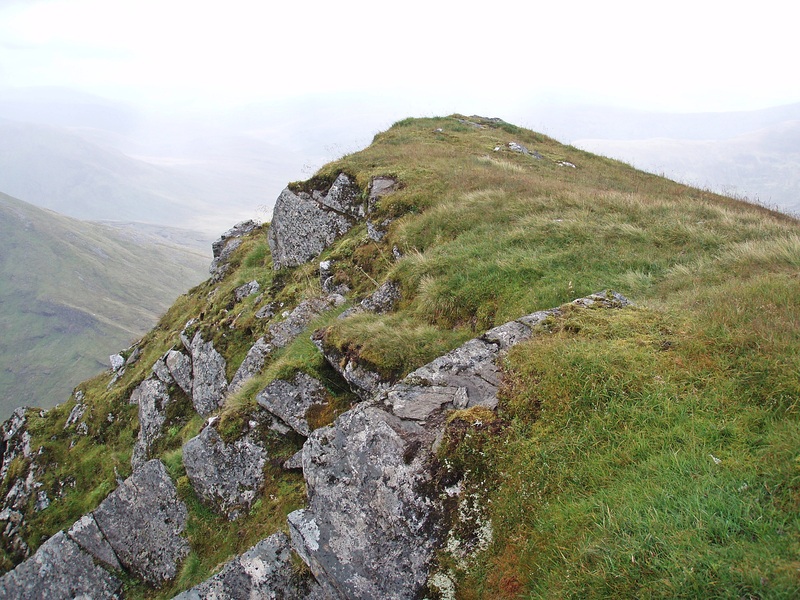 At a small cairn I left the main path and followed another one that zigzags up the SE ridge of Sgòr Eilde Beag. 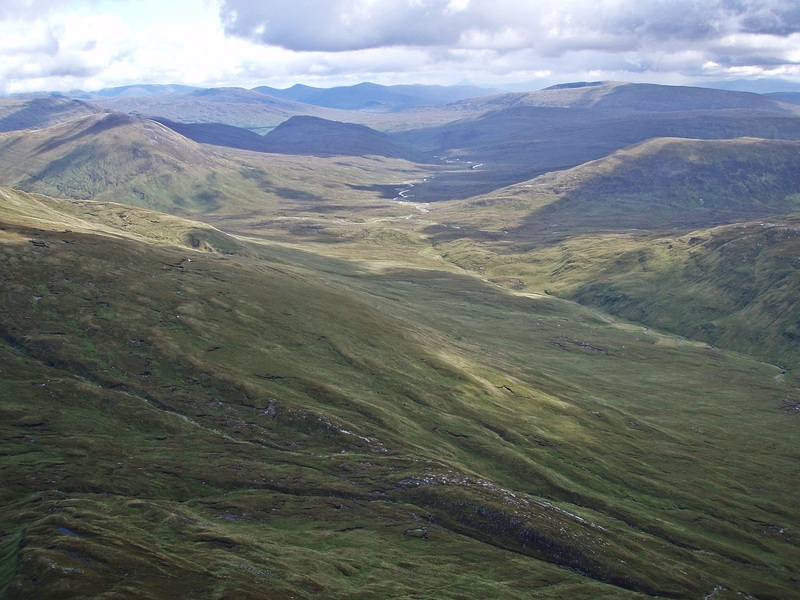 From here I got the first good view of Sgùrr Eilde Mòr and the lochans in front of it. There were more showers on my way up the grassy slopes leading to Sgòr Eilde Beag and Binnein Mòr’s S Top, but also some sunny spells. 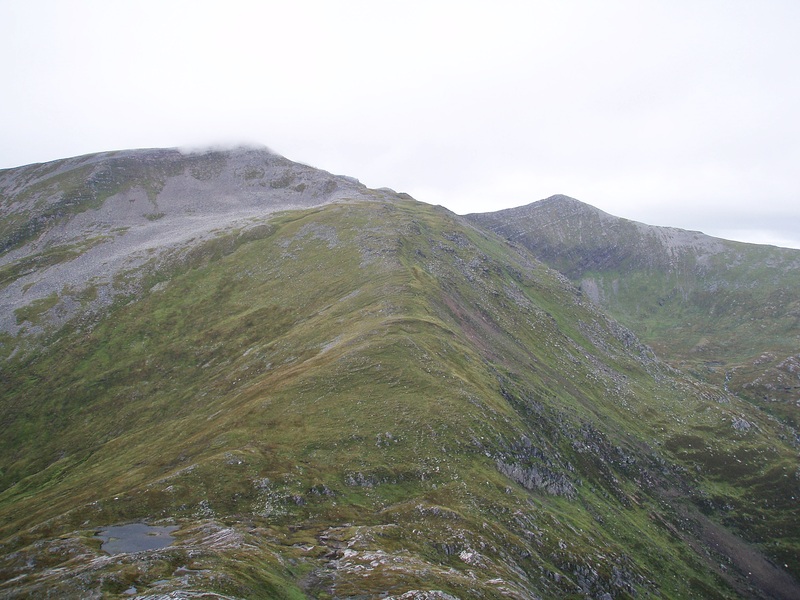 Coire nan Laogh and Na Gruagaichean. 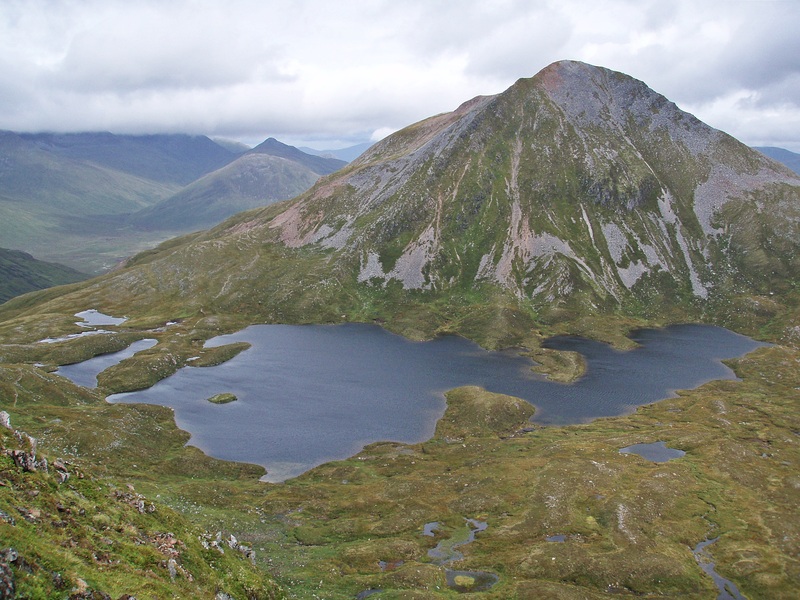 The views got better with increasing height, especially across the lochan to Sgùrr Eilde Mòr. 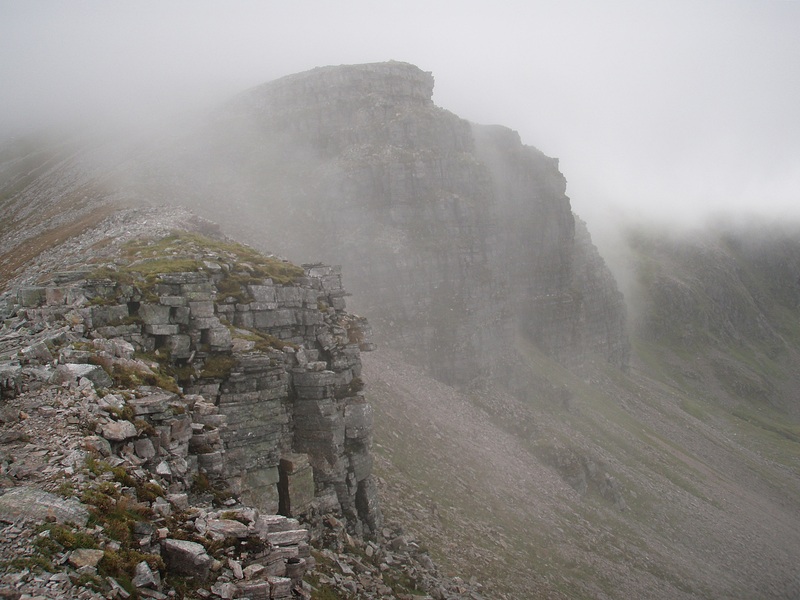 Coire a’ Bhinnein. 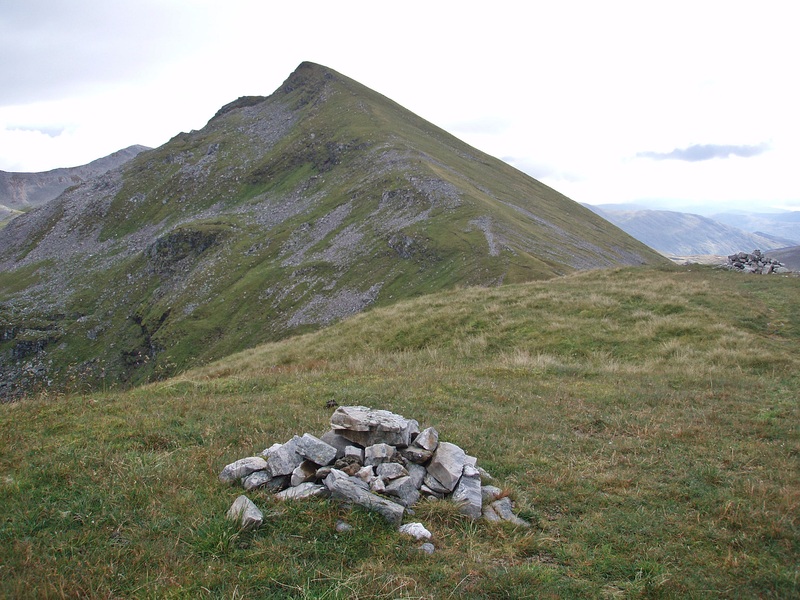 Sgòr Eilde Beag, today’s only (new) Munro Top. 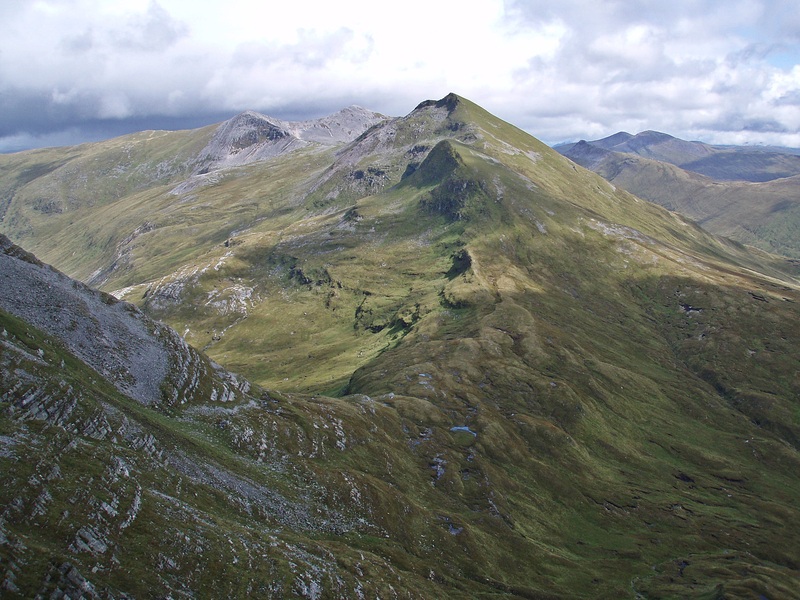 The ridge to Binnein Mòr and its S Top (on the left). 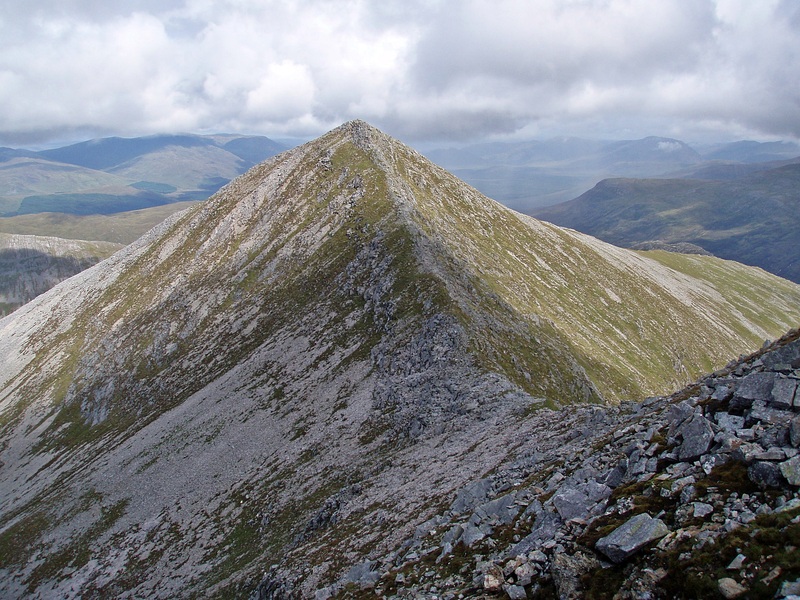 Binnein Mòr’s S Top which I had already climbed during the first part of this trip in September 2013. 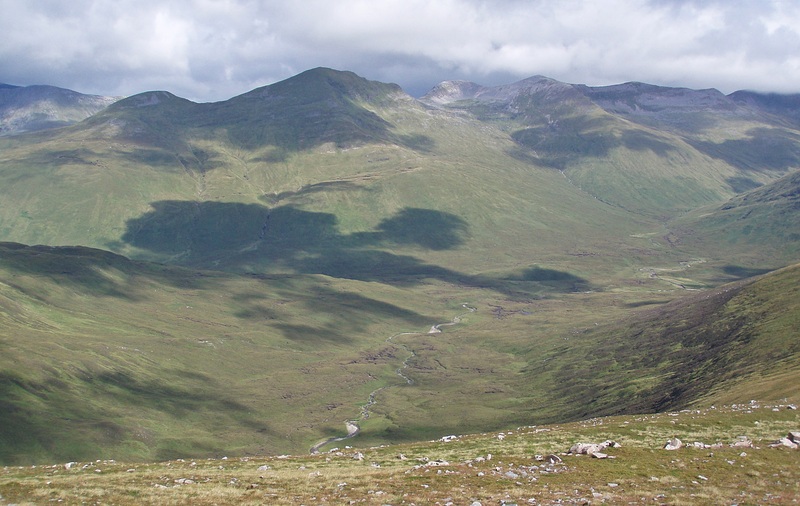 View towards Binnein Mòr. On my way along the ridge, clouds started to build up around me and the wind became stronger and freezing cold. I should have put gloves on but I couldn’t find a place out of the wind to stop and take them out of my rucksack. When I reached the summit, I got some views of my surroundings between the drifting clouds. Na Gruagaichean. 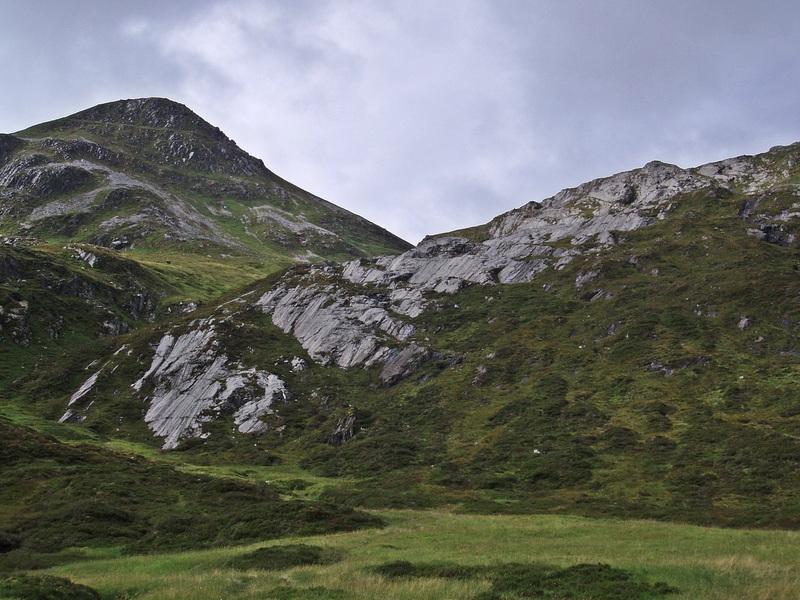 Binnein Beag living up to its name – it does look tiny from here! Past the summit the ridge consists of sharp rocks, and while I was scrambling over them with my wet and numb hands, I was longing for my gloves… I was glad to reach the end of the ridge where the terrain was still rocky but at least I was out of the ice cold wind. 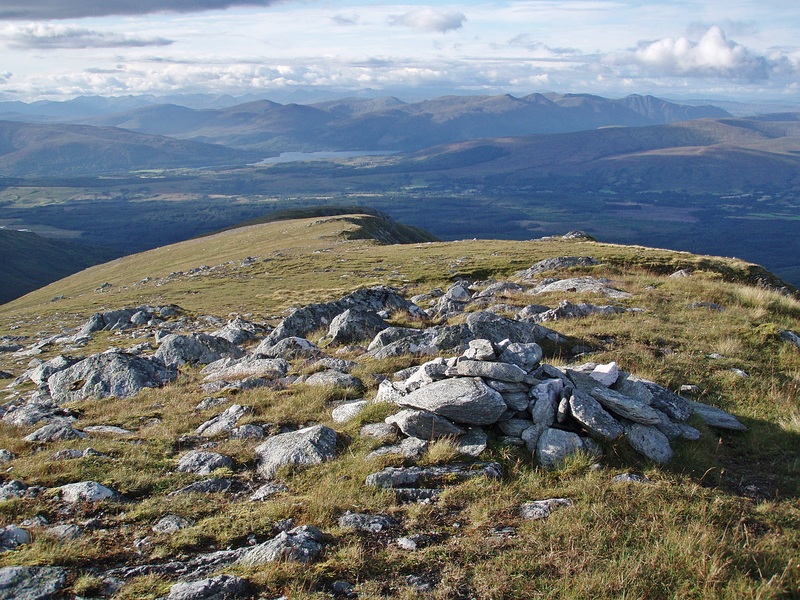 On my descent I got a good view of the hills across Glen Nevis, especially Sgùrr a’ Bhuic and Sgùrr Choinnich Beag. 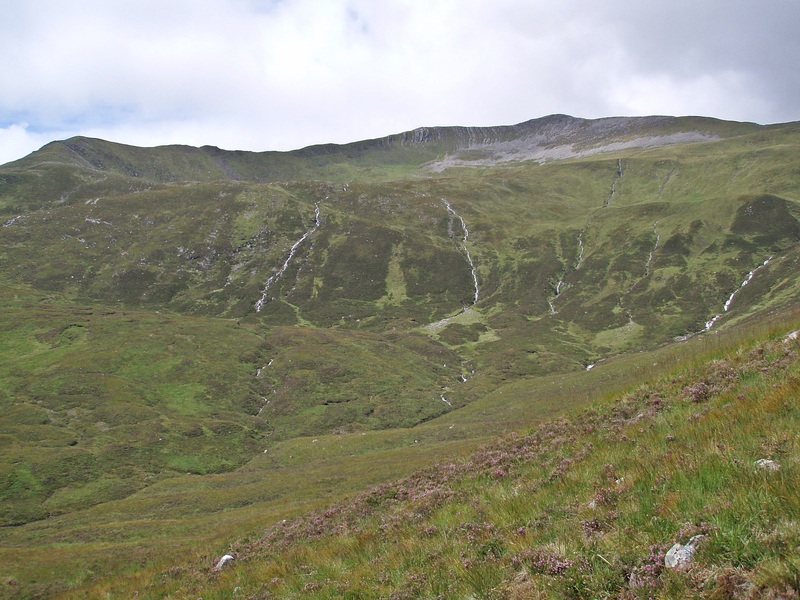 The section from Coire Bhealaich to Sgùrr a’ Bhuic was one I had not done before (on my first round I had climbed the Grey Corries as a round trip from Corriechoille), and I had been a bit concerned about the steep ascent, but from this direction it didn’t look too bad. After the rocky section the N ridge of Binnein Mòr becomes grassy and more pleasant to walk on, but then I mistook the diagonal line on the right hand side for an eroded path (there was even a small pile of stones at the top of it) and used it as my descent route. This turned out to be a bad idea, as the “path” leads to a landslide and very steep, loose ground. At one point I even got stuck as I just couldn’t get any grip with my boots and had to sit down to avoid tumbling down the slope. Very slowly and carefully I managed to continue, and eventually made it down in one piece, but I should have stayed on the ridge a bit longer to reach an easier-angled slope. After this excitement I needed a snack break by a small stream in the coire between the two Binneins, and when I had finished I even put my gloves on, at last! 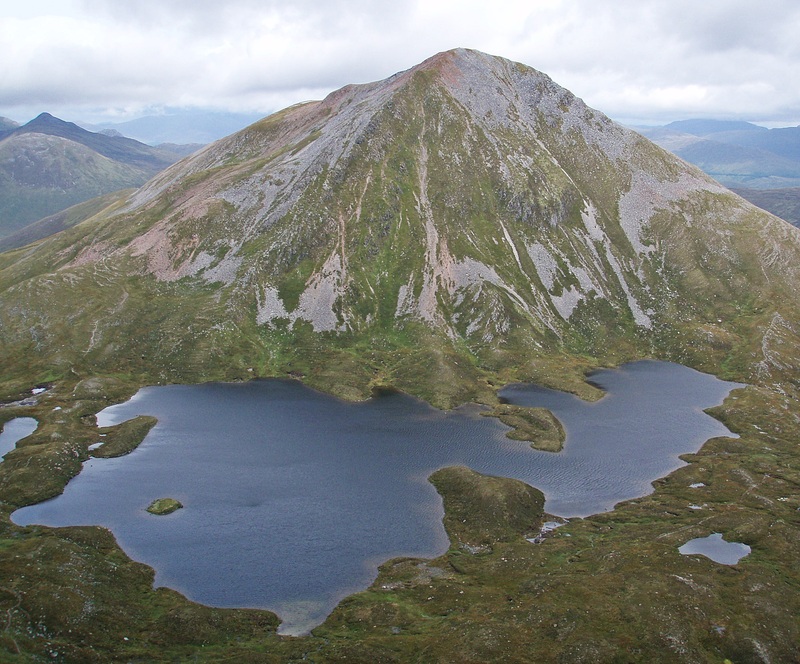 I left my rucksack by a prominent rock beside the lochan and climbed Binnein Beag via its S ridge. 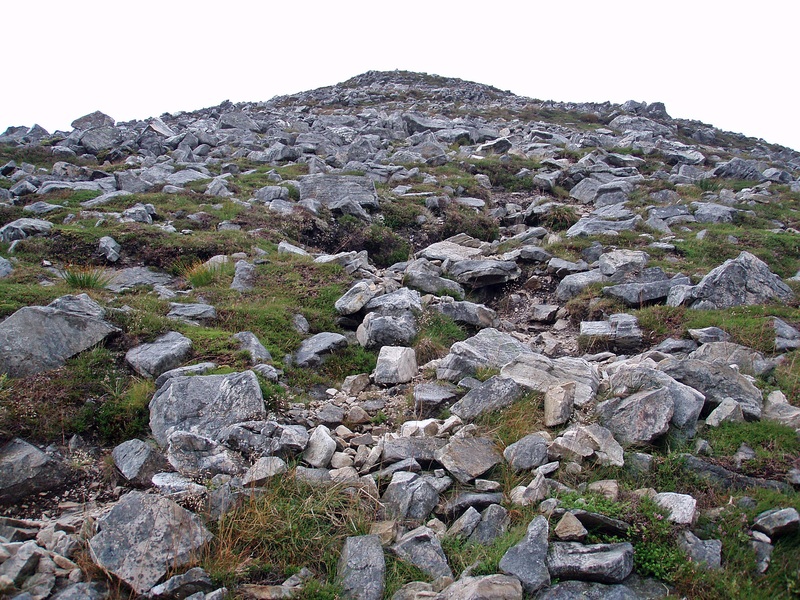 The ascent is rocky but there are various paths leading to the summit. There was no wind and only the occasional brief shower on my way up. 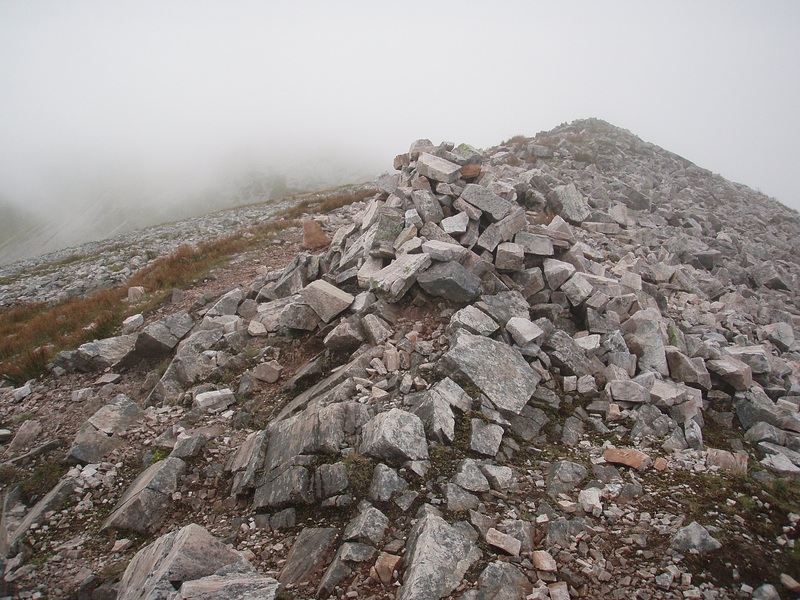 Unfortunately there were no views when I reached the summit as the clouds had lowered by then. 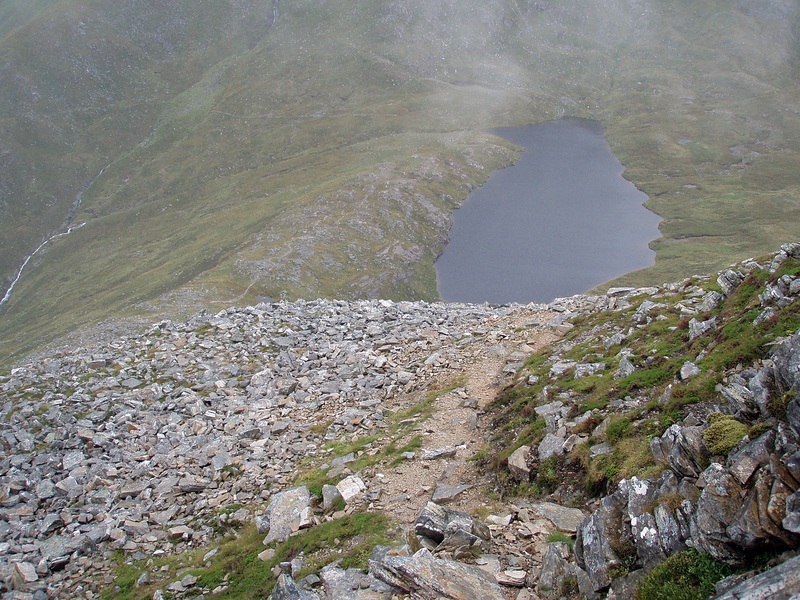 The way back down to the lochan. 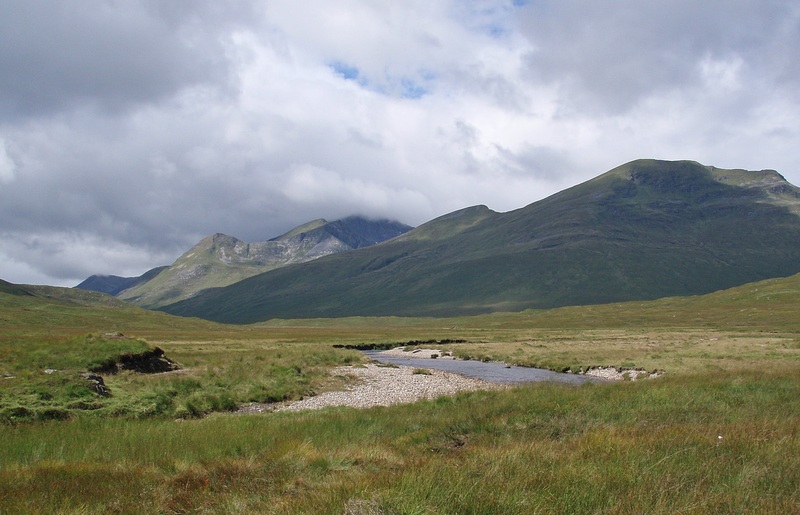 I collected my rucksack and walked along the path into Coire a’ Bhinnein, forded the stream and climbed up to the lochans below Sgùrr Eilde Mòr. By now it was raining constantly and I wandered around for a while, struggling to find a sheltered camp site. Eventually I found one in a dip near the start of the path up to Sgùrr Eilde Mòr. It had been a cold night with rain and strong gusts most of the time and I had woken up freezing in my sleeping bag a few times, but when I was ready to go at 09:00 the rain had stopped and my tent was only slightly damp when I packed it up. Although the sun was out by now, I was still freezing in the ice cold wind as I climbed up to Sgùrr Eilde Mòr. 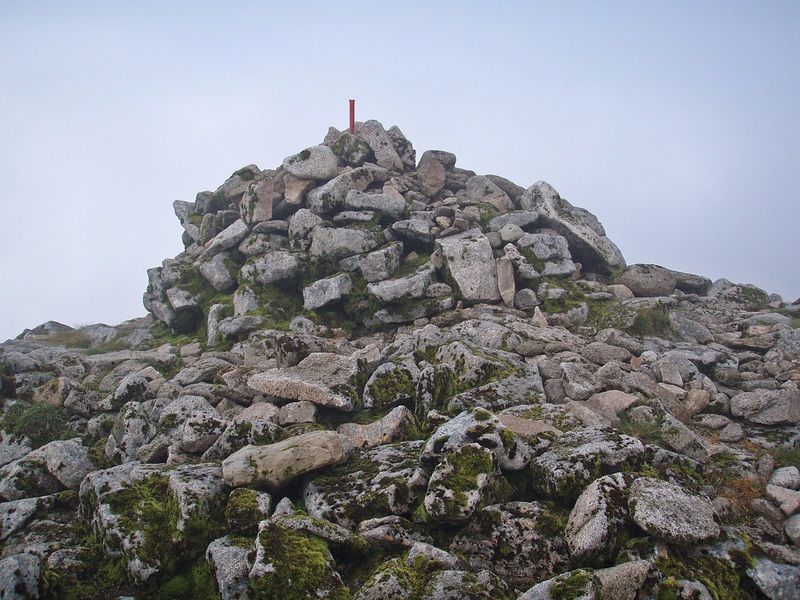 Summit of Sgùrr Eilde Mòr. 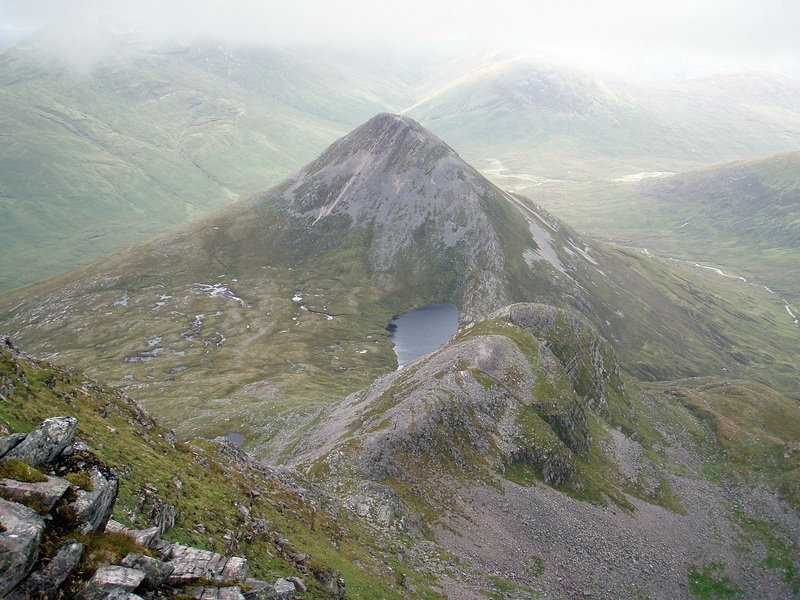 View S to Buachaille Etive Mòr. While I continued along the broad NE ridge, the wind eased and it started to feel warm in the sun – at last! 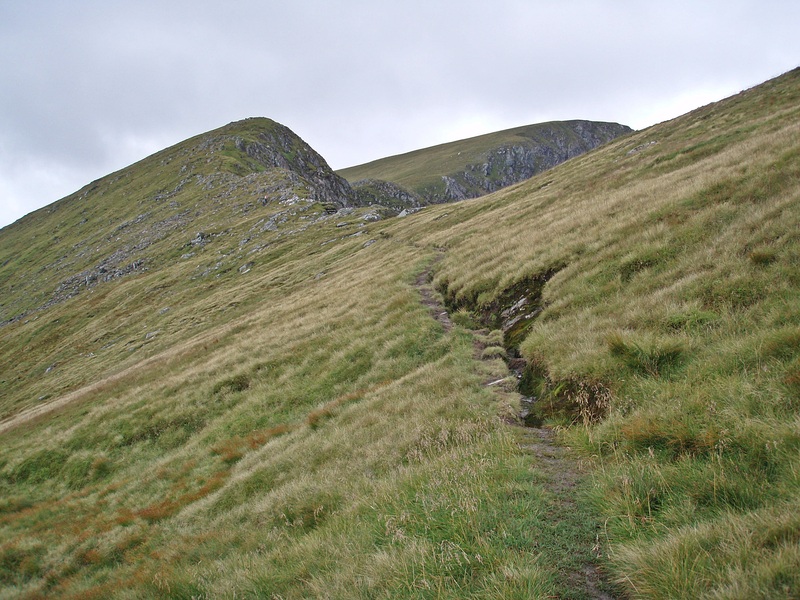 During my first attempt at this route in 2013 I had bypassed the Druim Sgùrr Eilde ridge, but the path marked on the OS map is very patchy, and awkward to walk because of the angle of the hillside. I found walking along the ridge a lot more pleasant, on easy terrain covered in short grass and moss. 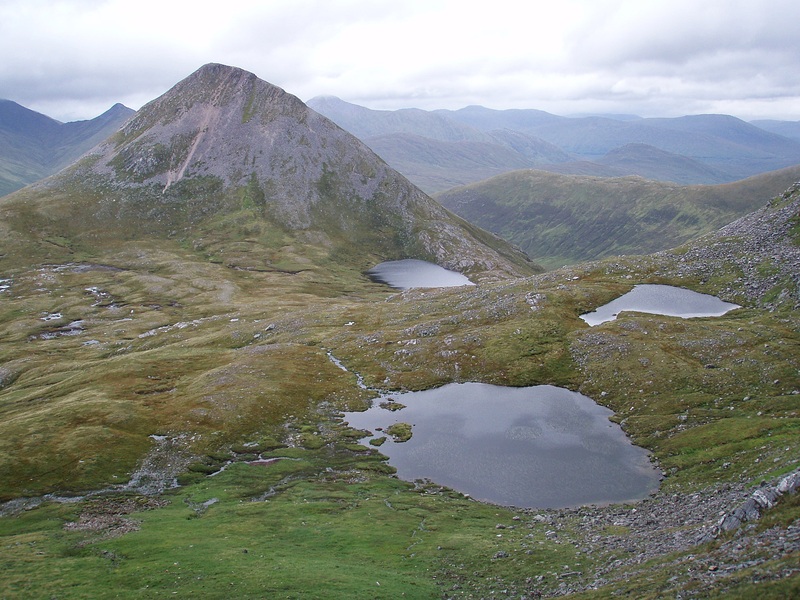 Unnamed lochans E of the ridge, and Loch Eilde Beag beyond. 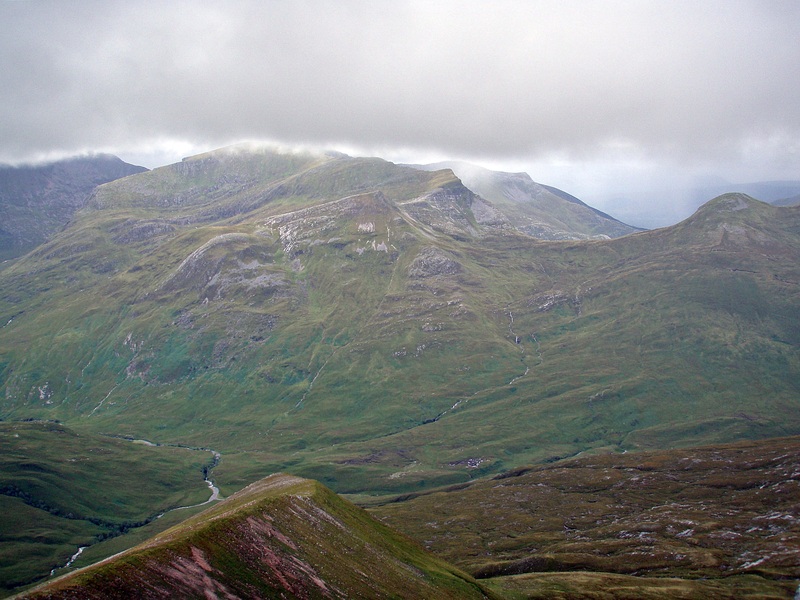 View across Glen Nevis to The Grey Corries. I reached the floor of the glen near Tom Buidhe and had a long lunch break in the sun, using this convenient “bench” by the Abhainn Rath. After my break I first continued on the S bank, but soon found this shallow section of the river where I could easily just wade across without getting my feet too wet. 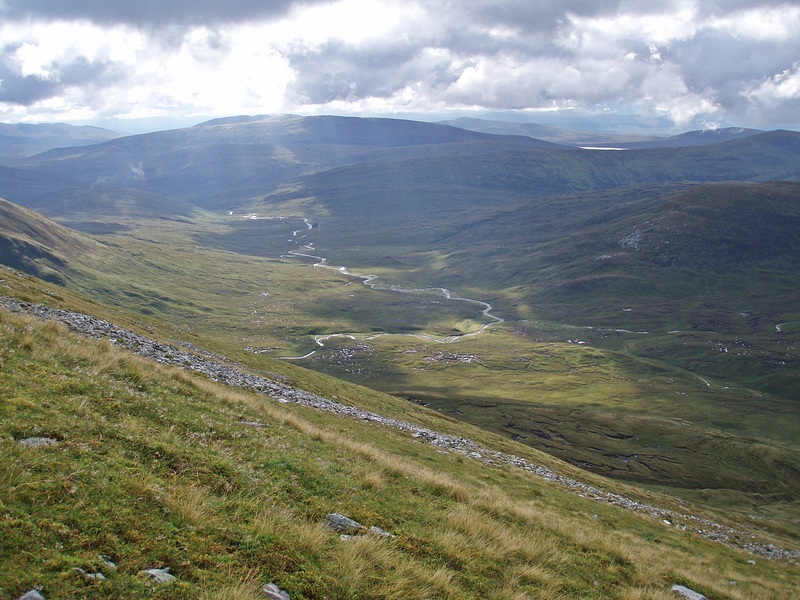 Just before Meanach I followed the path along the Allt nam Fang, which leads all the way to the Lairig Leacach. 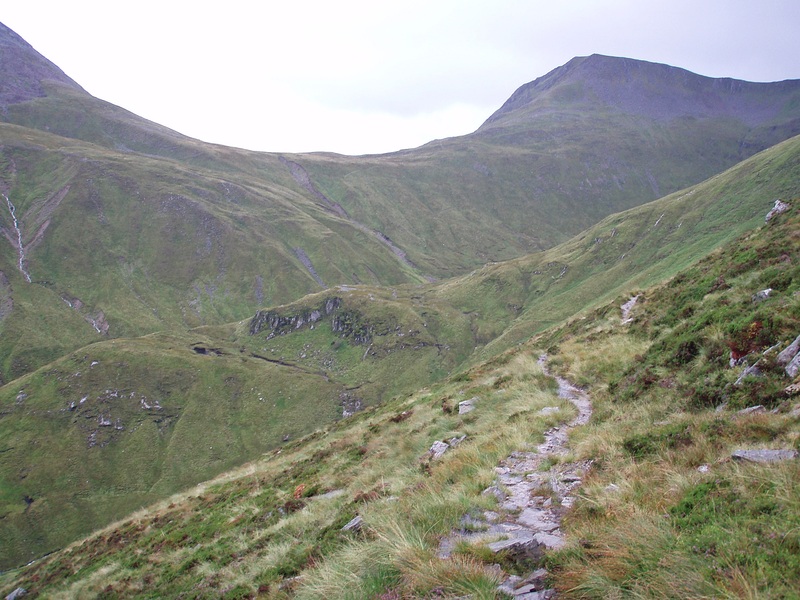 I left this path shortly before its highest point and walked across some boggy ground to Stob Bàn’s SW ridge. 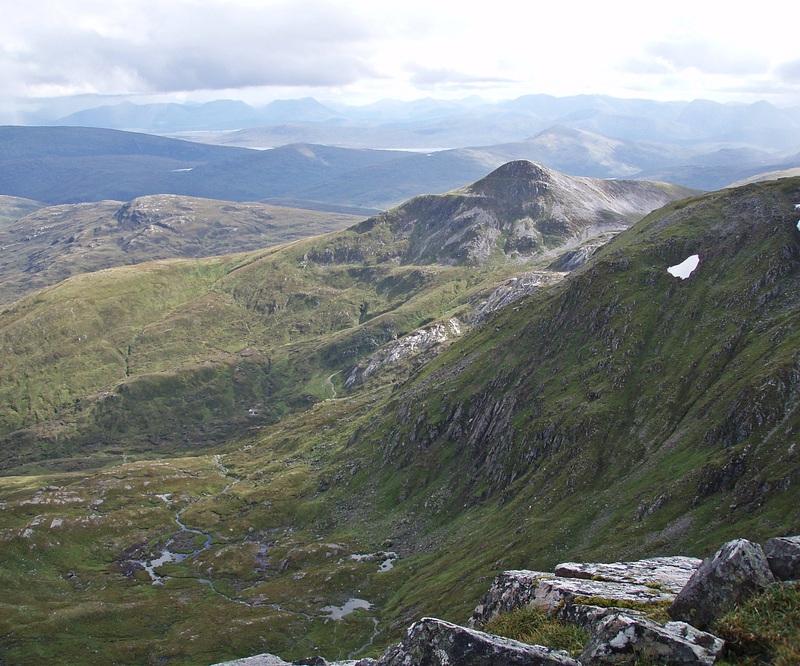 I climbed up to the ridge beside the Allt na Càbaig. Although not really that long, this ascent seemed like a long slog, and it became even worse when it suddenly started to rain. The rain became heavy, and while I was standing there with my back against the wind and rain, I got soaking wet within a few minutes. 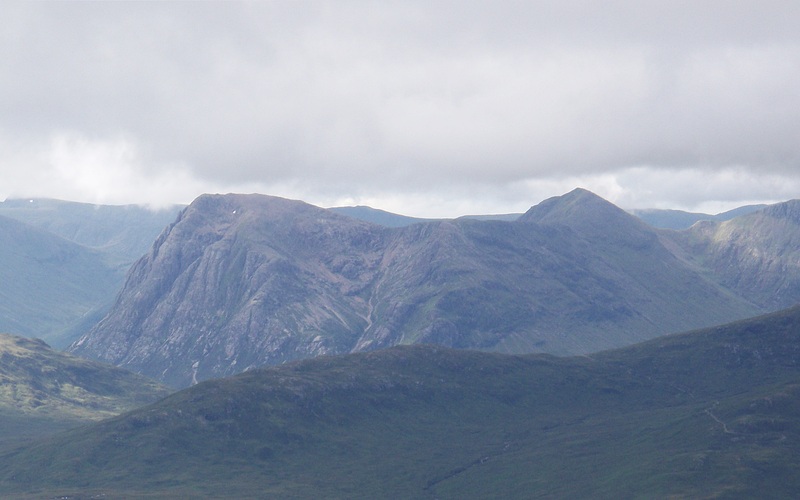 … and to Buachaille Etive Mòr, which lifted my mood slightly! So far this walk had not been what I had been hoping for (it was August after all, and a lot of the time I had been freezing and/or wet), and I had already decided to take a break from it. I am used to walking with wet feet most of the time – my Inov8 Roclites never stay waterproof for long – and I normally don’t mind, as long as it’s not too cold and I can change into dry socks for the night. But this time my feet were not only wet, but also cold all the time, and somehow I just had enough and felt I needed to do something about it. 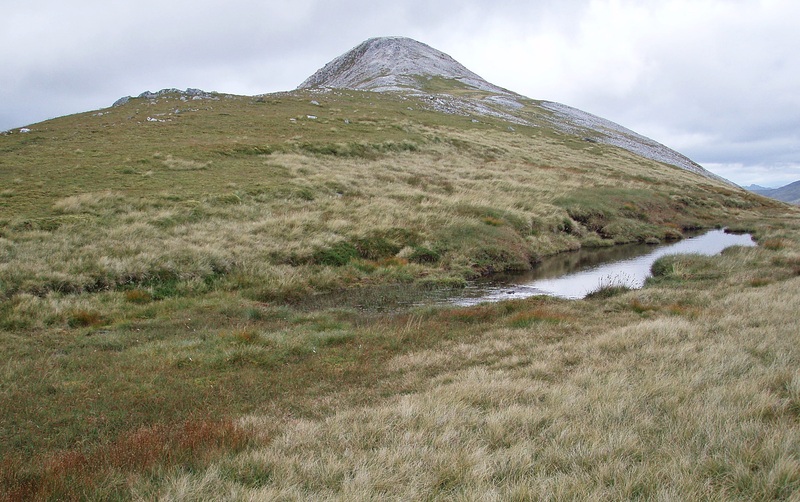 From my first walk over the Grey Corries I remembered a nice grassy spot down in Coire Claurigh which I had kept in mind as a potential camp site. 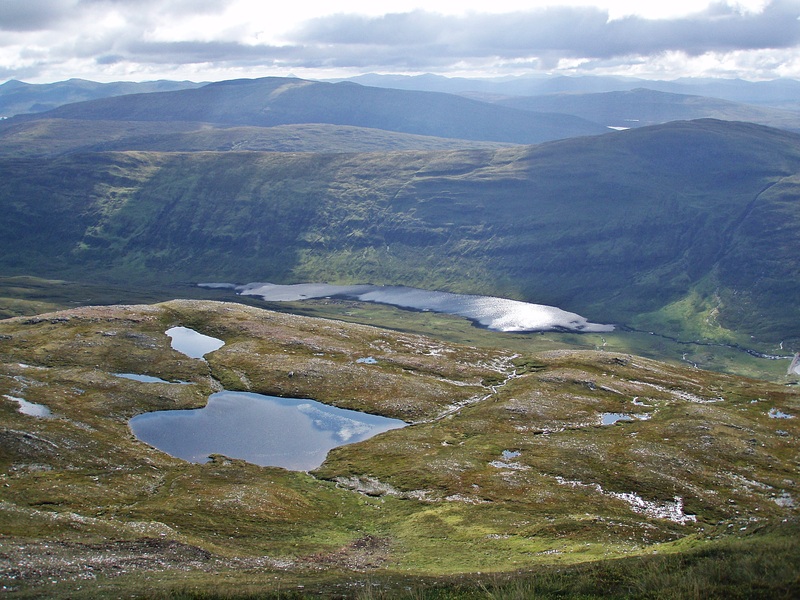 My original plan had been to camp by the lochan on the bealach between Stob Bàn and Stob Choire Claurigh, but now I was looking for something more sheltered and closer to my planned walk out route for tomorrow. 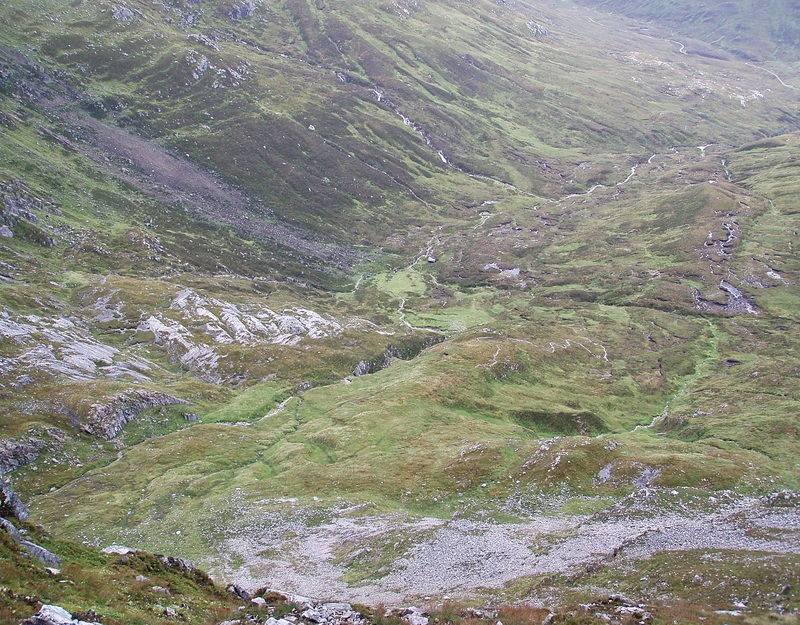 But first I had to descend the very loose and steep path to the bealach. Anyway, I found a nice camp spot at around 19:30 and had a quiet night, without freezing for a change. While I had a leisurely breakfast in my tent I suddenly heard the noise of a vehicle approaching. First I thought I must be imagining things or maybe hearing an aircraft in the distance, but when I looked out the door I saw an Argocat making its way up the steep slopes of the coire, driving past my tent and disappearing up the hill towards Stob Bàn. When I was ready at 11:00 it was warm but overcast and the midges started to gather around me, so it was time to get going! Rock slabs behind my camp site. I took a short break in Lairig Leacach Bothy and had a quick read through the bothy book. I found some entries from fellow TGO Challengers particularly interesting as I had also stopped here for a lunch break on my way from Spean Bridge to Loch Treig in May this year. 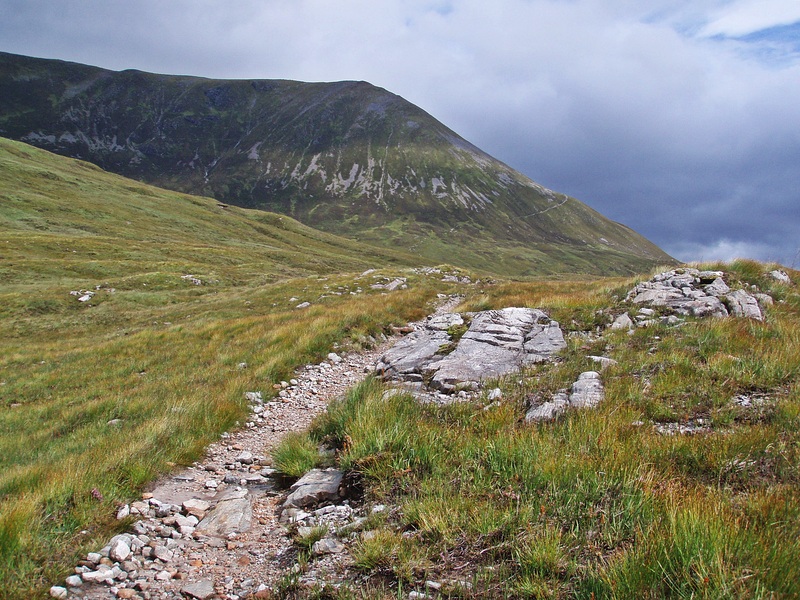 I had seen cowpats around the bothy and expected the worst on my way through the Lairig Leacach, but I didn’t come across any cattle until I had almost reached the gate before the track enters the forest. There they were, spread out on both sides of the track, and I walked past them heroically (= sweating and with my heart racing! ), but gave a cow with her calf who were standing in the middle of the path a wide berth. On the long road walk to Spean Bridge my shoulders started to feel sore and I was hoping for a lift, but there was no traffic at all. When I was almost there a car with two ladies stopped and although we were only a two minute drive from the village, I accepted their friendly offer. In Spean Bridge I checked the train and bus times (15:58 and 16:15 respectively) to Fort William, but the bus was going straight to the Youth Hostel, so I settled for that. I spent the time waiting for the bus at the Woollen Mill where I had cheese and broccoli soup, cheesecake and a caffe latte. At the Glen Nevis YH I booked a bed for two nights and spent the next day shopping in Fort William. I needed new boots, they should be waterproof, light and comfy and not cost a fortune, if possible. After walking up and down the High Street, visiting each and every outdoor shop on the way without finding what I was looking for, I ended up at the Ellis Brigham branch behind the train station. I had a look around the shop myself and found three boots that I liked, then I asked a shop assistant to get me one pair each in my size to try on. He first asked me what kind of walks I was planning to do with them, then measured my feet, and soon came back with the three pairs. The ones that felt comfortable straight away and were most suitable for my purposes as they had the grippiest sole, were a pair of Salomon X Ultra Mid 2 Gtx boots (the women’s model). They fitted me perfectly well in the shop but I felt I needed a larger size because my feet would be swelling up a bit after a long day’s walking. Unfortunately the next size was not in stock, and I was already resigning to the fact I had to keep walking in my old, leaking boots… But then the shop assistant suggested I’d try the men’s model half a size up – a brilliant idea, as that one was just perfect in every way! After chatting a bit more about my planned walk I left the shop as a very happy customer, and pleasantly surprised about the knowledge, professional advice and good service I had just experienced. I must admit I buy most of my outdoor gear online because it is cheaper, the customer service in many shops is non-existent and I have come across too many shop assistants who don’t have much knowledge about the things they sell, so this was an unusual and new experience for me. After spending one and a half days in Fort William mainly eating, drinking and sleeping (apart from buying new boots and socks) I was on my way again. 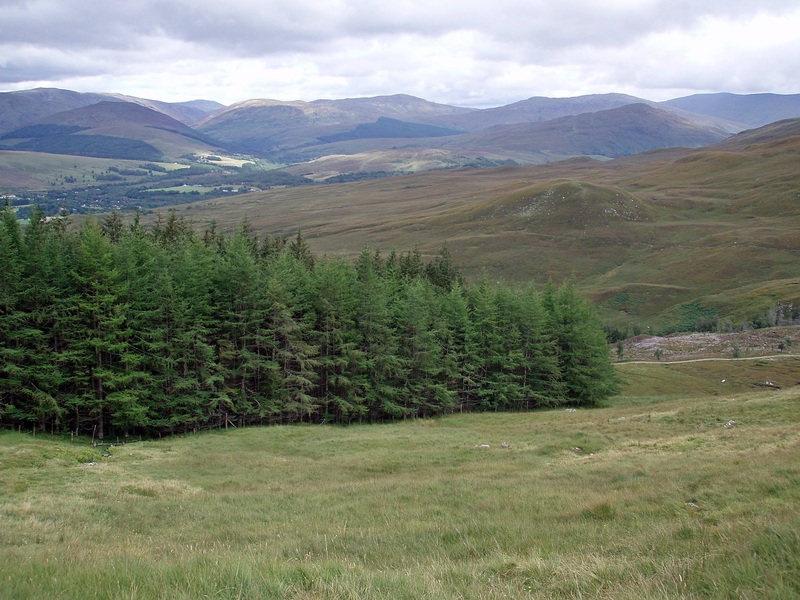 I took the 09:16 bus to Spean Bridge and set off on the long road walk to the start of the Lairig Leacach. Again, I couldn’t get a lift because there were no cars going in my direction. 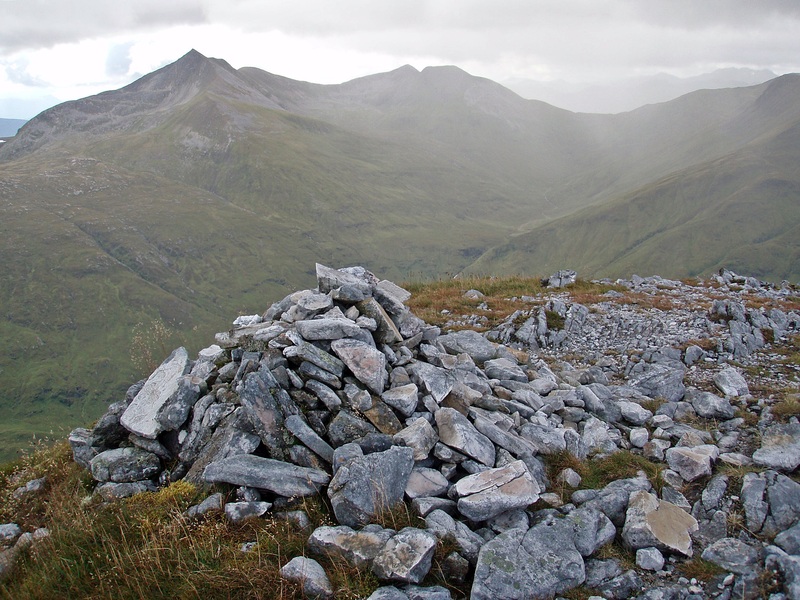 Higher up the ground becomes drier and easier to walk on, and eventually I reached the first of today’s Munro Tops, Stob Coire Gaibhre. 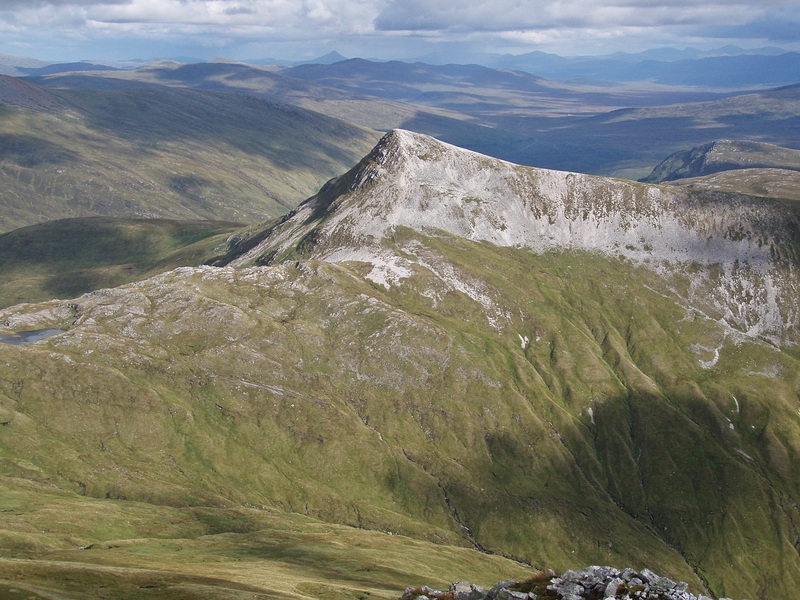 From here I got my first view of the beautiful Coire na Ceannain. 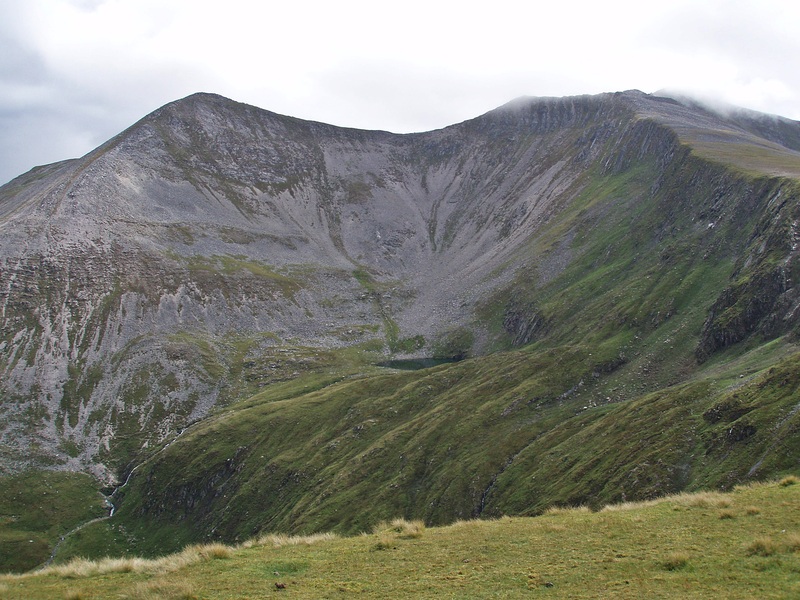 Lairig Leacach with Cruach Innse and Sgùrr Innse. 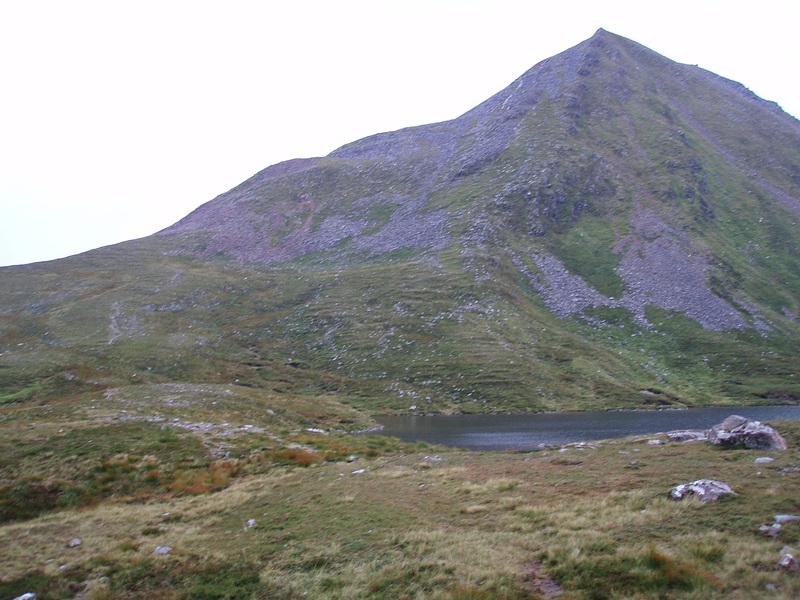 After a pleasant walk up along the grassy edge of Coire na Ceannain I left my rucksack at the junction of ridges and made the short detour to Stob Coire na Ceannain. 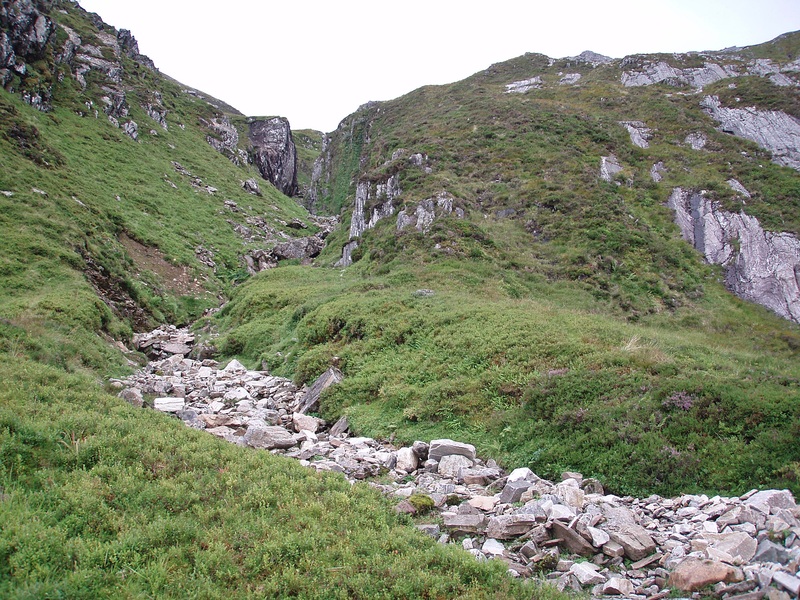 Although the connecting ridge is quite narrow, there are no difficulties. 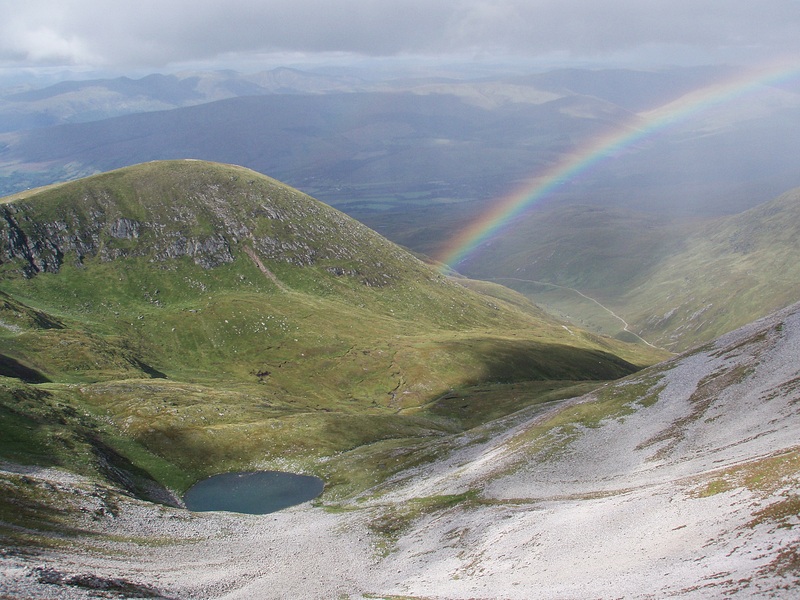 On my way along the ridge I got another nice view of Coire na Ceannain and Stob Coire Gaibhre, now even with the added bonus of a lovely rainbow! 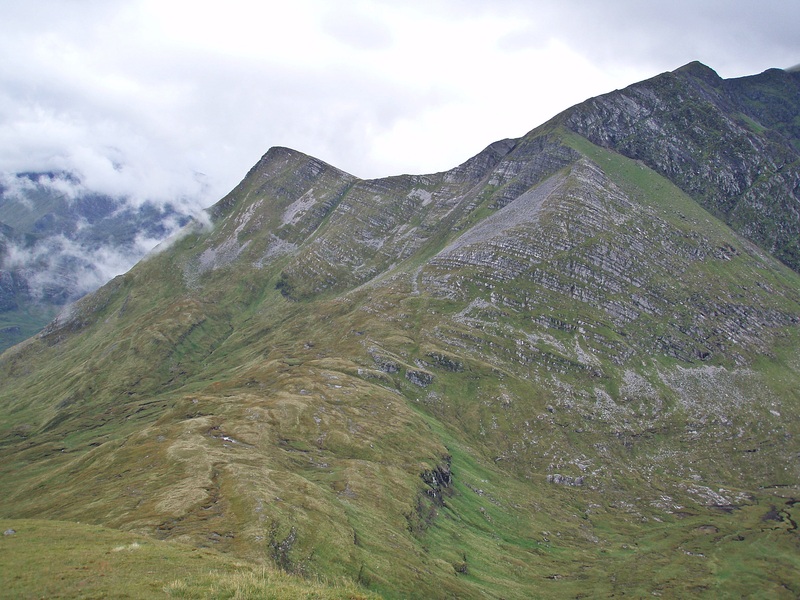 Cùl Choirean and Stob Bàn. 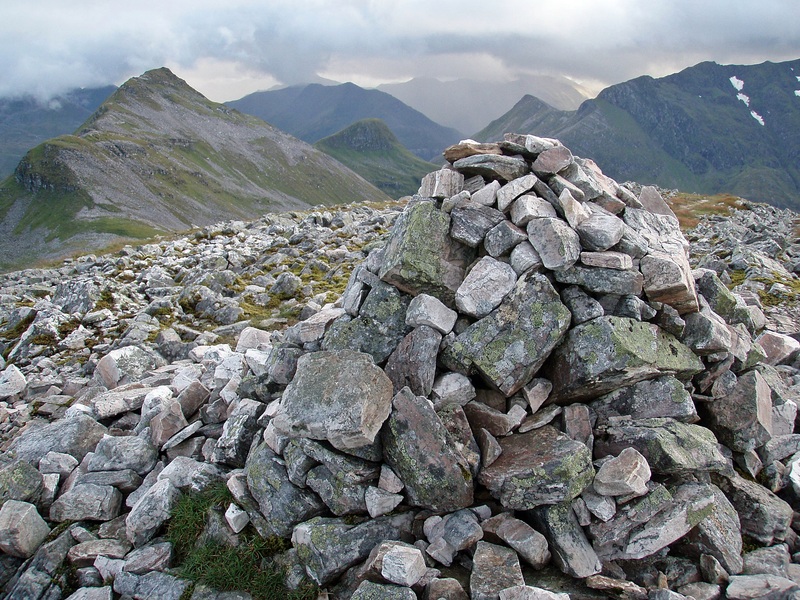 At the summit of Stob Coire na Ceannain, looking towards Stob Choire Claurigh. 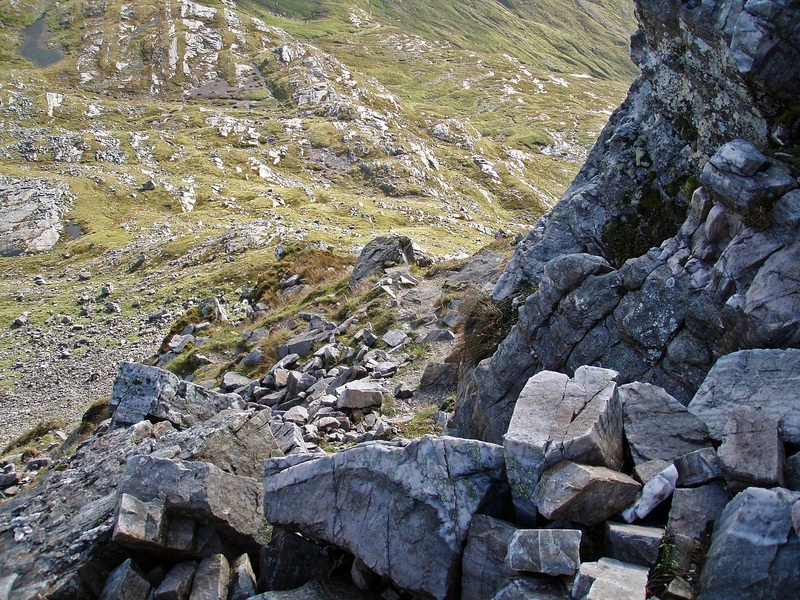 On the path avoiding the crags below the summit of Stob Coire na Ceannain. After collecting my rucksack I came across a steep rocky wall that seemed to be blocking my way, but coming closer I found a clear path bypassing this obstacle. 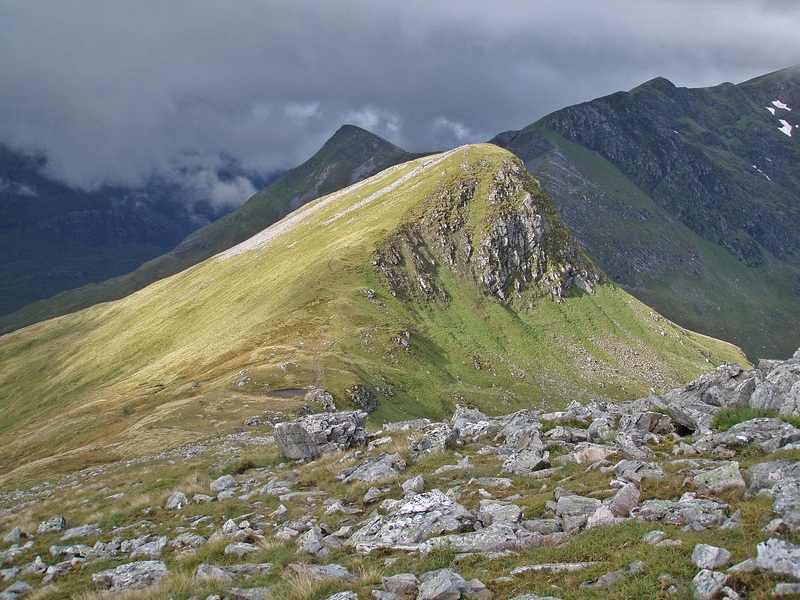 Looking back to Stob Coire na Ceannain. 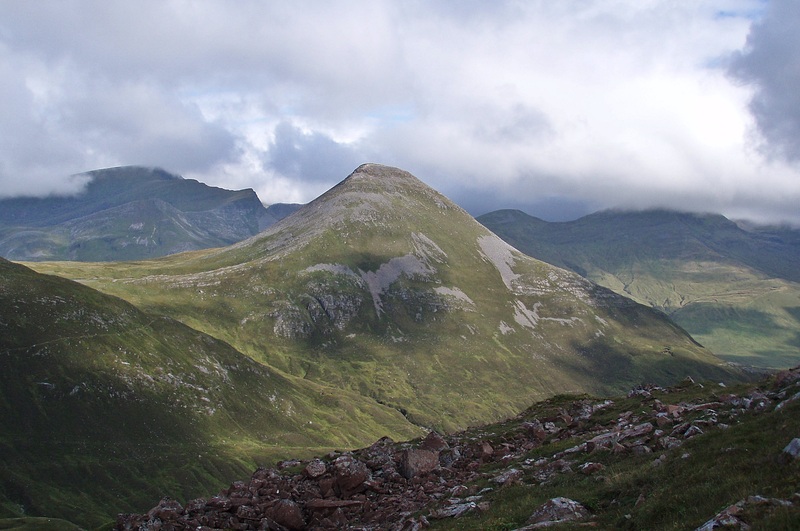 Stob a’ Choire Mheadhoin and Stob Coire Easain. 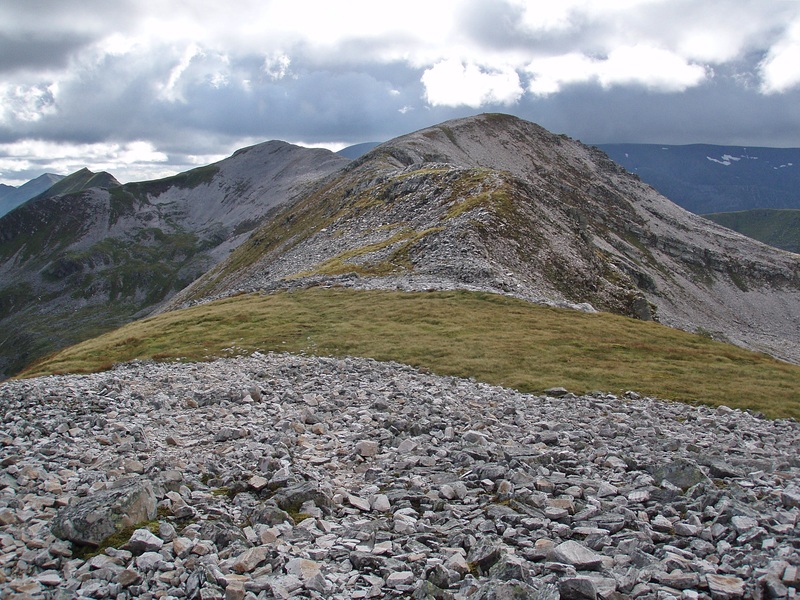 Stob Choire Claurigh, today’s first Munro. 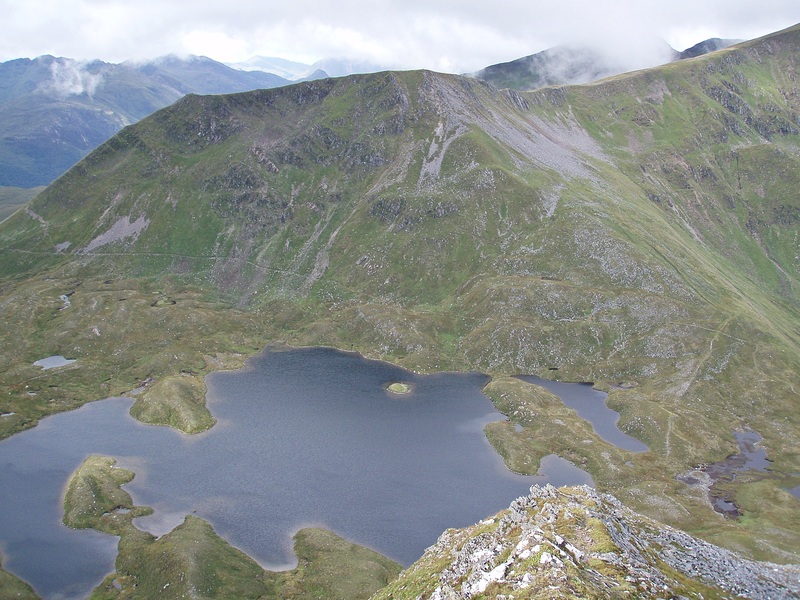 The lochan where I had originally planned to camp after descending from Stob Bàn two days ago. 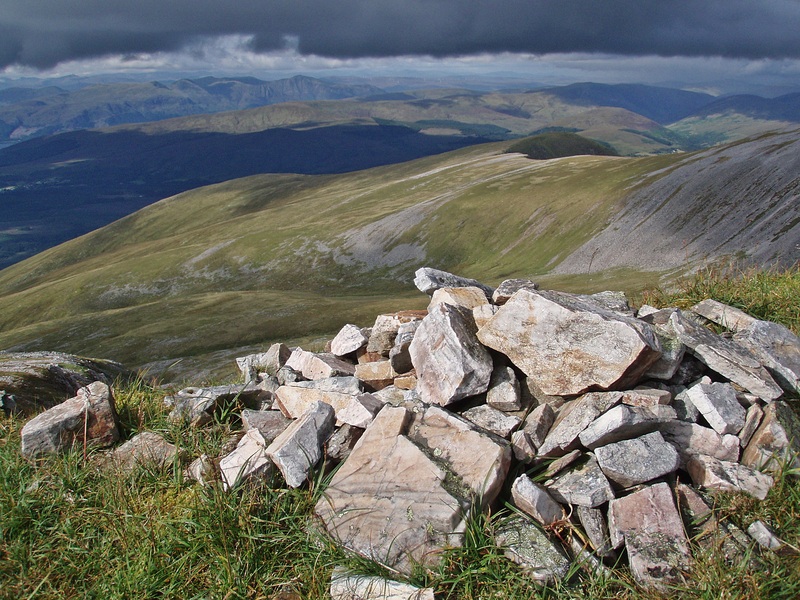 View down to Glen Nevis and the Eastern Mamores. 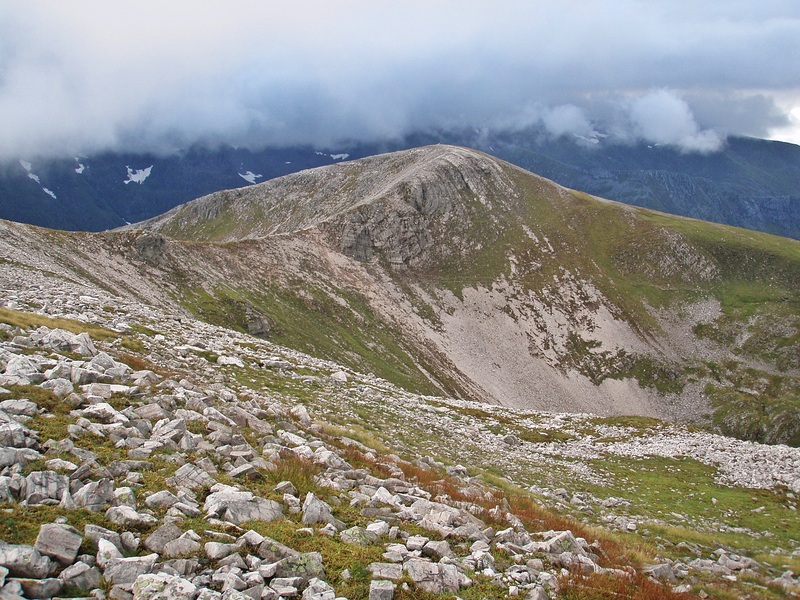 Now the whole winding ridge of the Grey Corries was stretched out in front of me and I couldn’t wait to walk along it. 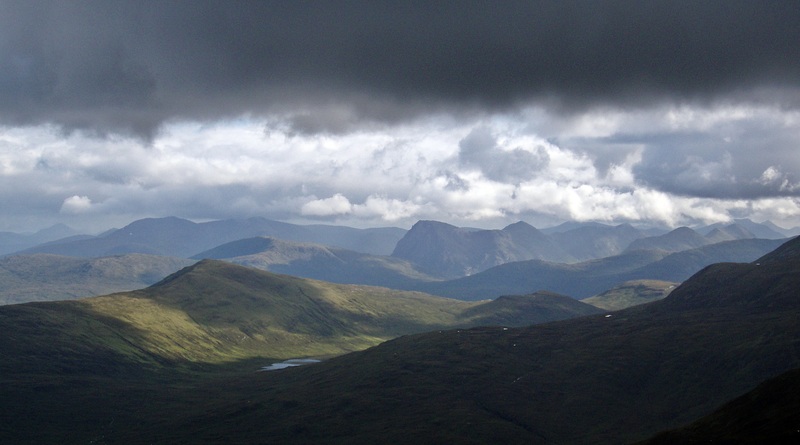 Until now it had been sunny but dark clouds were forming when I reached Stob a’ Choire Lèith. 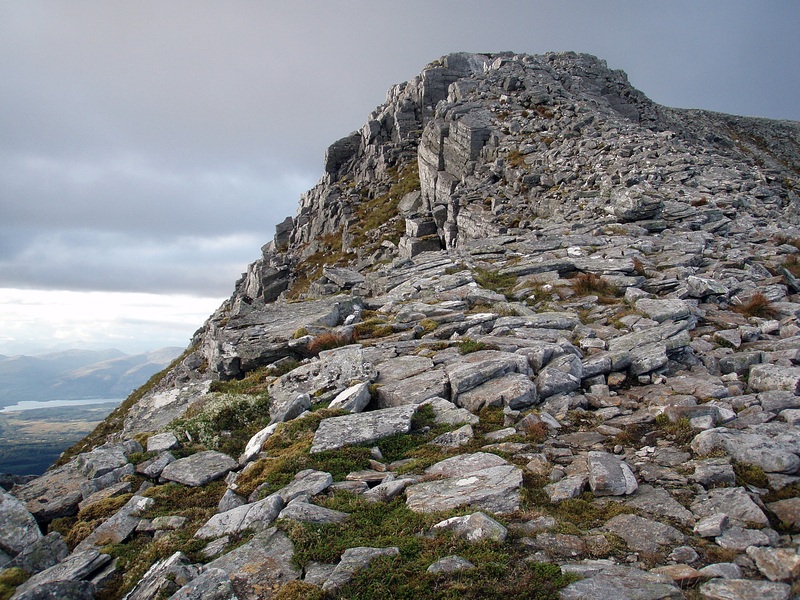 After this Munro Top the ridge turns into an interesting, wall-like feature but again, there is a rocky path winding its way up and along this section. 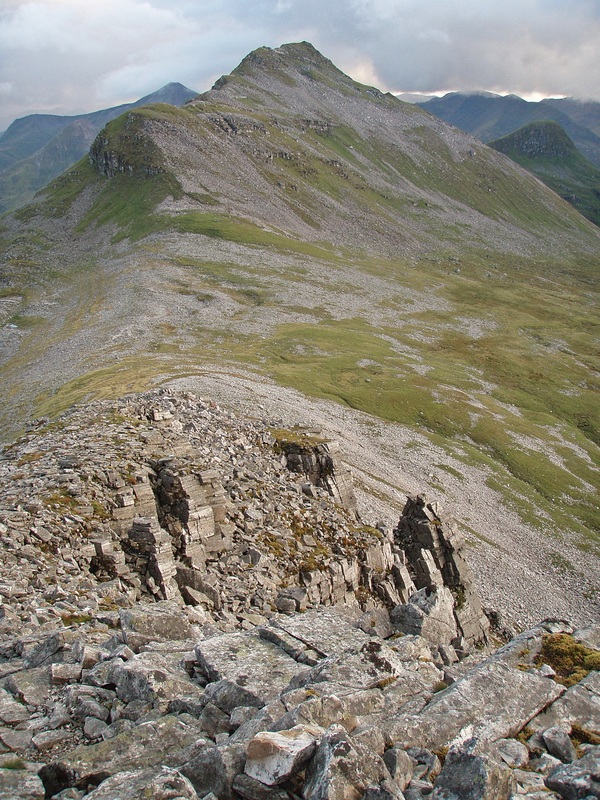 Stob Coire Cath na Sìne. 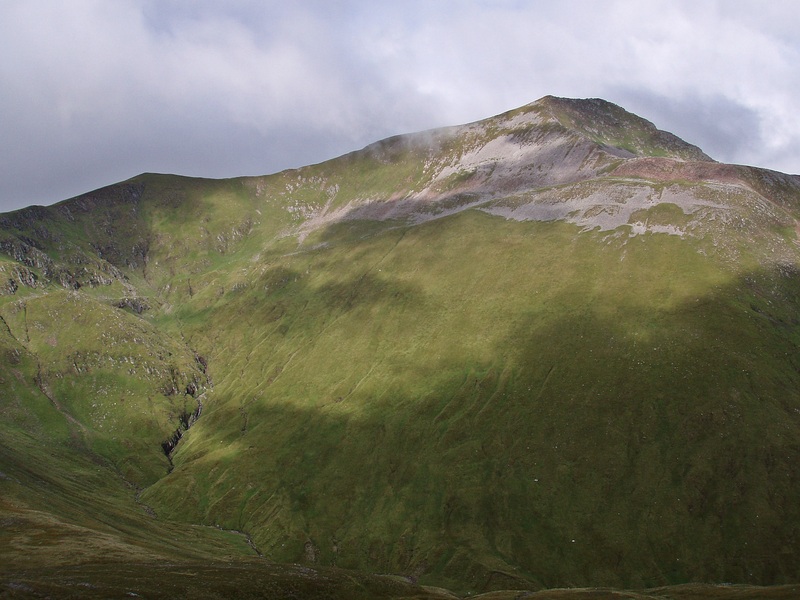 Stob Bàn, looking much pointier from this direction. The way ahead towards Caisteal. Just when I approached one of the most interesting parts of the ridge, the clouds that had accumulated earlier lowered and reduced the visibility to a few metres. 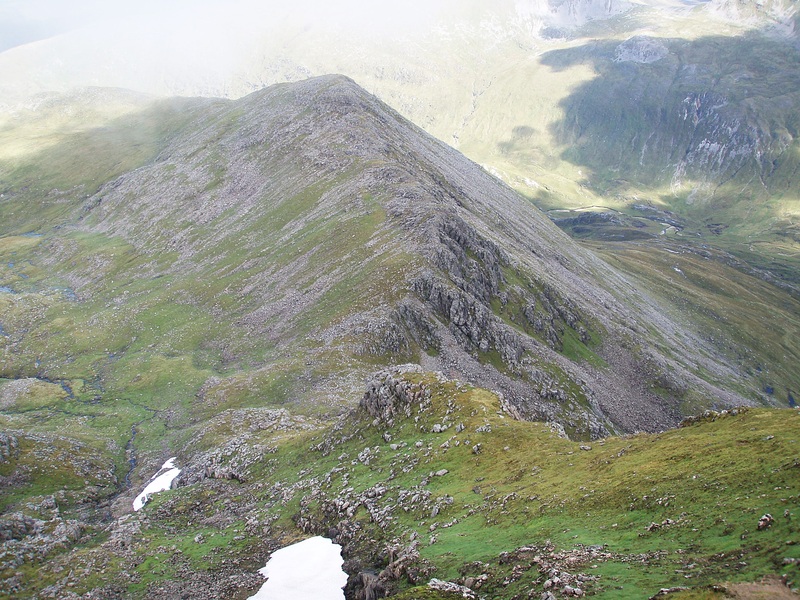 Vertical cliffs to the N of Stob Coire an Laoigh. A short time later the clouds lifted just above the ridge, and I could see Stob Coire Easain ahead. 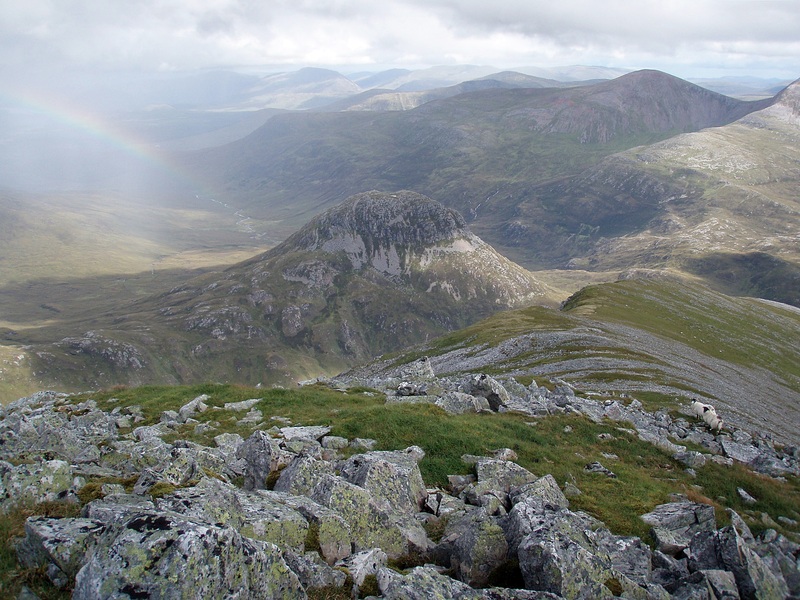 But first I had to climb over the second Munro of the day, Stob Coire an Laoigh. 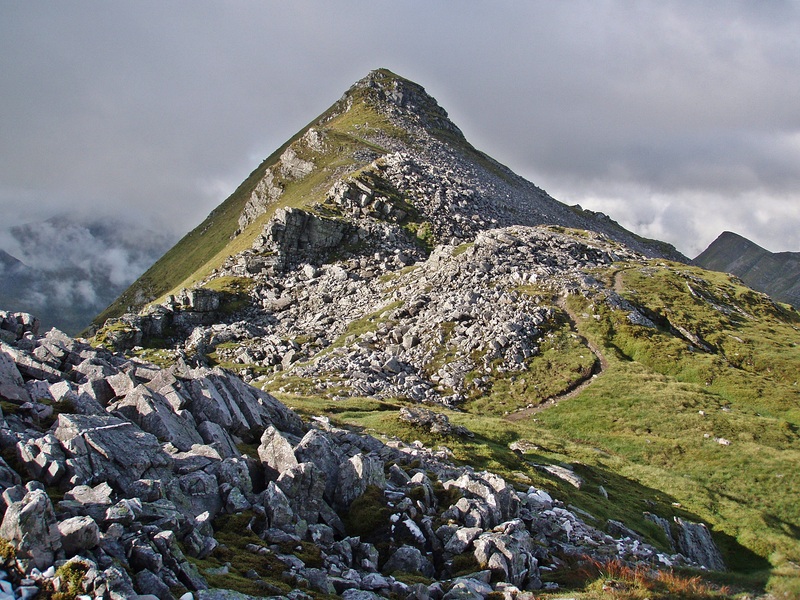 On my way towards Stob Coire Easain I noticed a bypass path leading to the Munro Top Beinn na Socaich – great, that would save me climbing Stob Coire Easain twice! 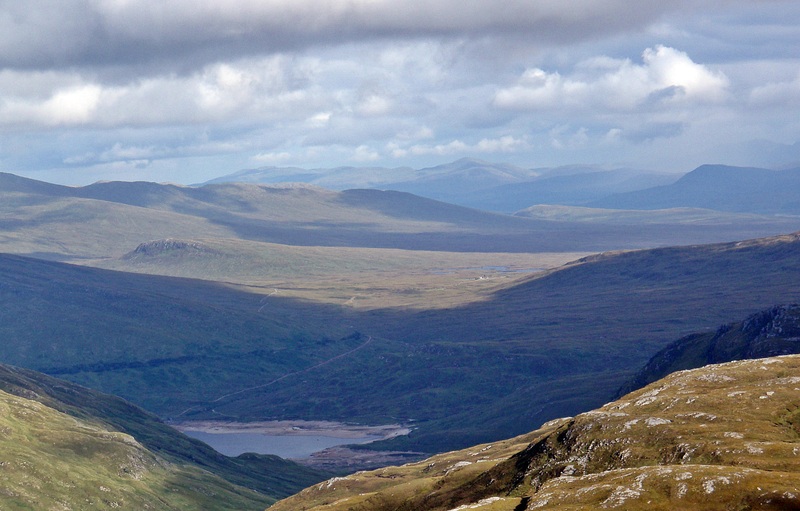 The clouds had completely lifted by now and, looking down to my left, I could see Coire Easain and Bealach Coire Easain. On the bypass to Beinn na Socaich. From here I could also see the impressive cliffs that had been hidden under the clouds before, with their shapes now enhanced by the late afternoon sun. 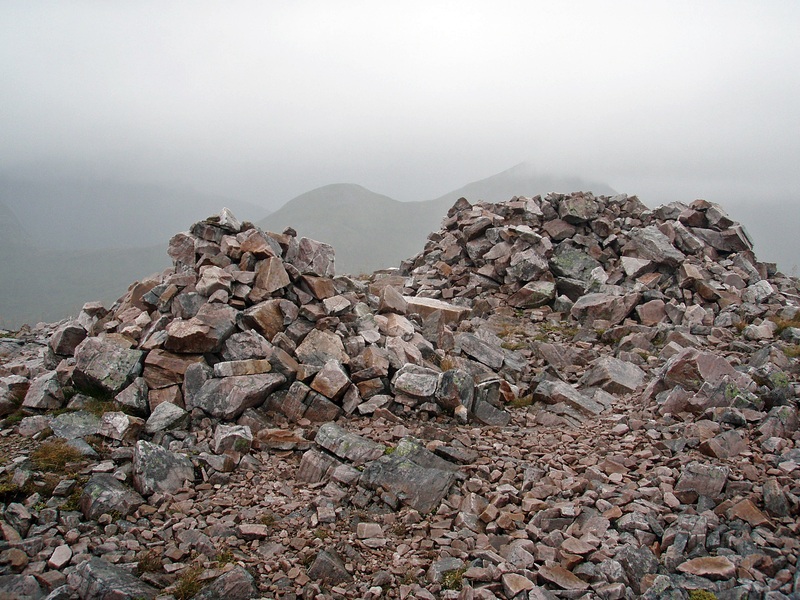 But I was still hoping to make it to the bealach beyond Sgùrr Choinnich Beag so I returned to Stob Coire Easain and this time I climbed to its summit. Climbing down from Stob Coire Easain took me longer than expected as I couldn’t remember where the best line of descent was and I couldn’t see an obvious route down. I must have strayed off too far right and ended up scrambling over sharp-edged boulders which was awkward with the big rucksack. I finally came across a path of sorts but it was already 19:30 when I arrived at the bottom of the rocks. 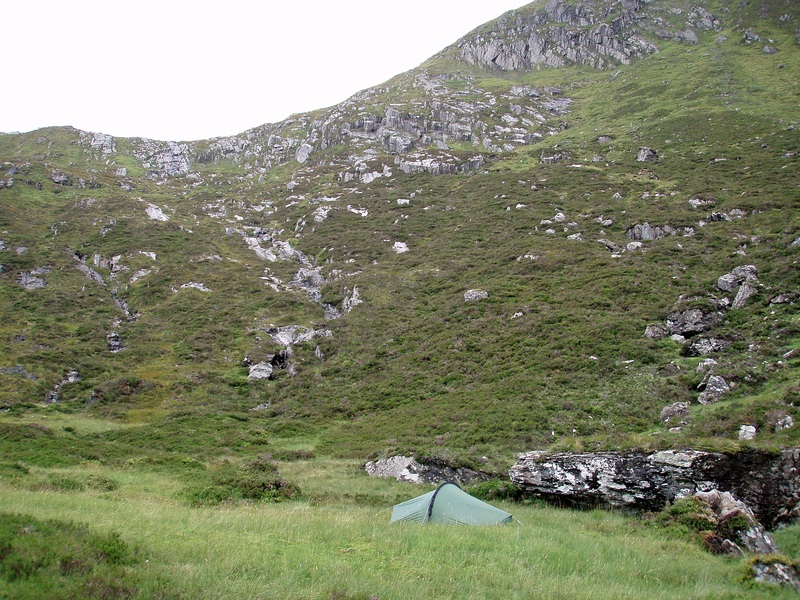 I gave up on the idea of climbing over the next Munro and Top and decided to camp in Coire Easain instead. In the meantime the wind had picked up and I spent a long time wandering around the coire searching for water and a sheltered pitch. 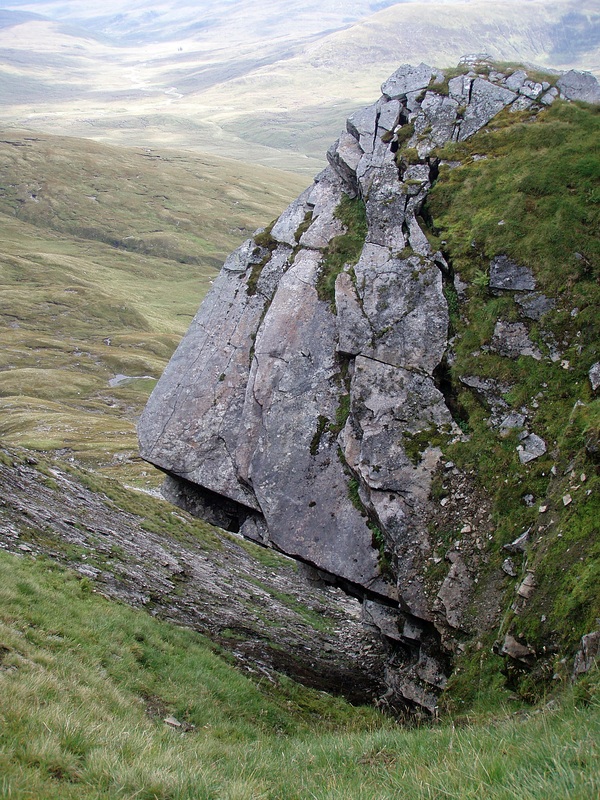 No such luck, the coire seemed to be funnelling the wind and I couldn’t find a level, dry spot for my tent. 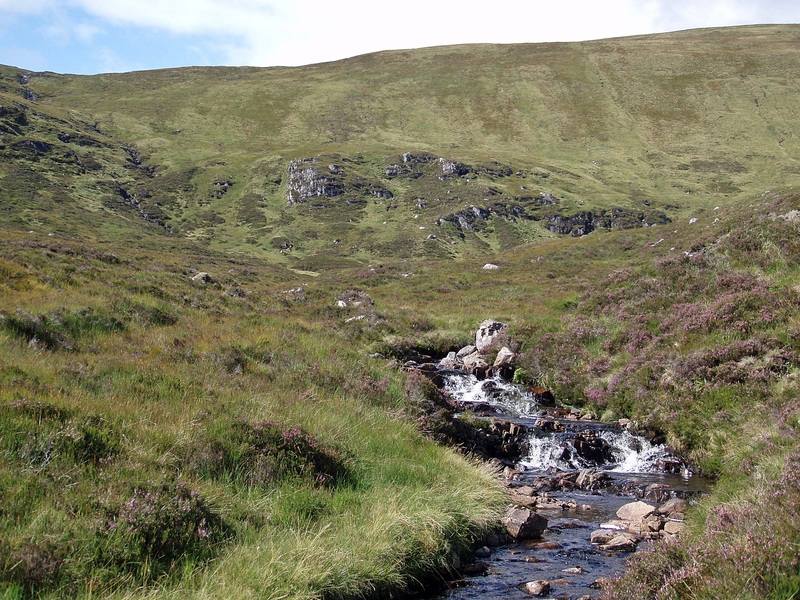 Eventually I collected some water from one of the streams in the coire and climbed back up to the bealach. Strangely enough it was less windy up here and I put my tent up on a flattish area of grass surrounded by stones and boulders. Later the wind calmed down but it rained during the night. At 06:00 I looked out of the tent and found myself surrounded by thick fog but a couple of hours later the clouds started to lift. Looking back to my camp site and Stob Coire Easain. 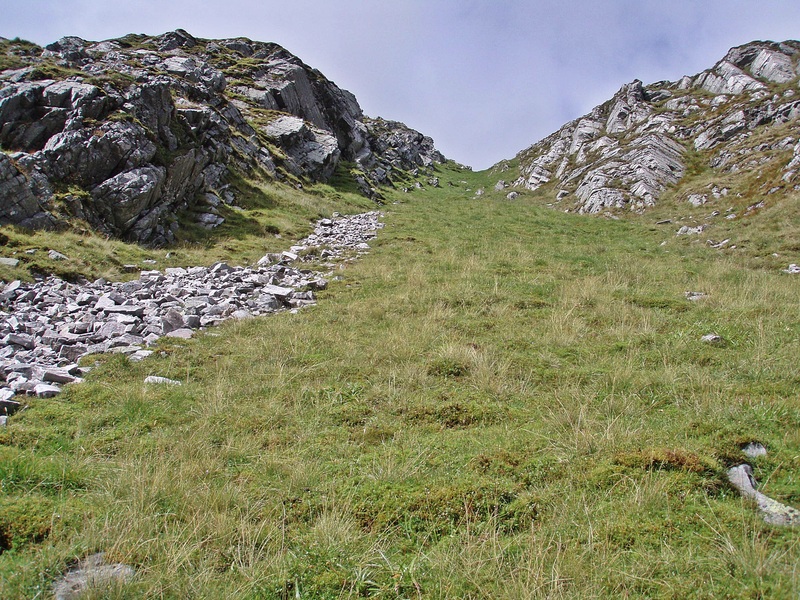 A steep and rocky path leads up to the next Munro Sgùrr Choinnich Mòr. 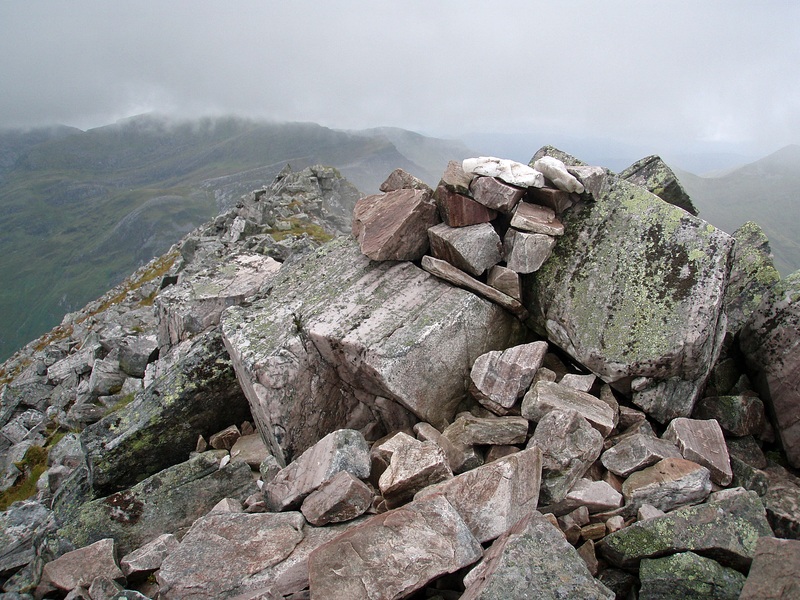 Rock slabs with large gaps in between near the summit. On my way down I spotted a tent by the lochan on the next bealach and by the time I arrived there, its owner had finished packing. He was doing the same round as me but in the opposite direction, so we could swap notes about our respective routes. 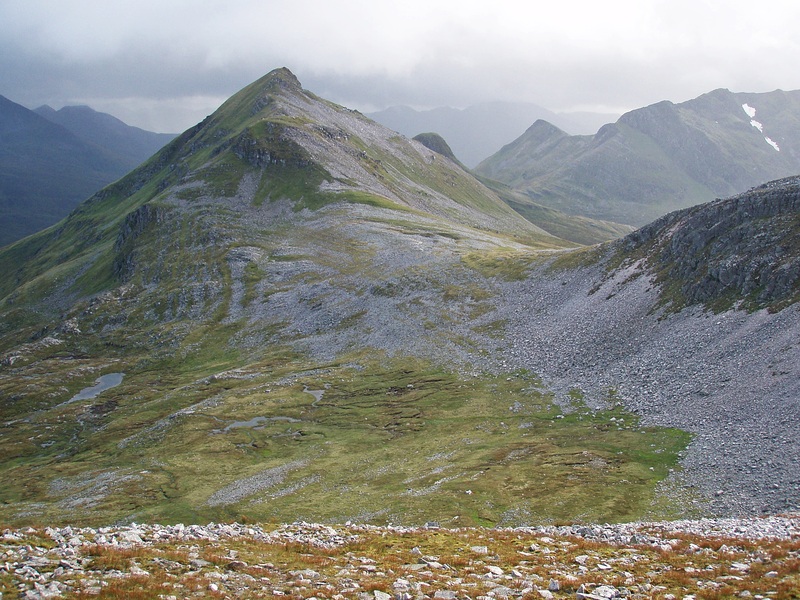 For the ascent to Sgùrr a’ Bhuic he recommended to use an obvious grassy gully and not the more direct (and steeper) route further right he had taken in descent. I was glad to hear that, as it confirmed what I thought would be the safest and easiest option. Sgùrr Choinnich Beag lit up by the morning sun. 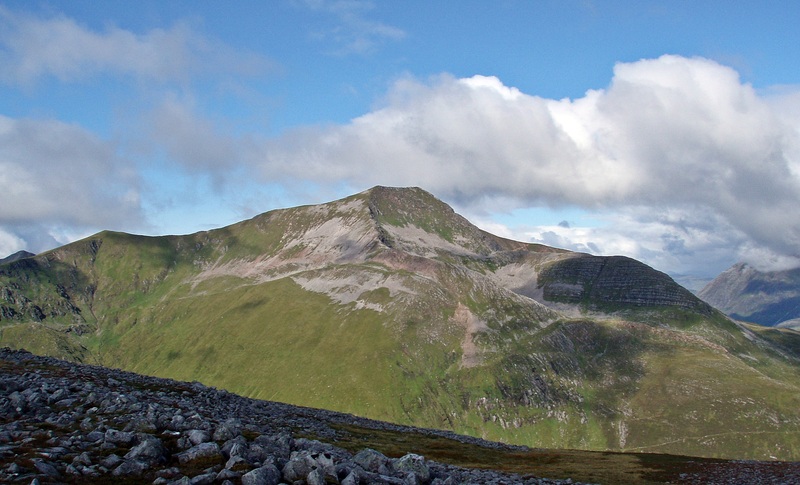 Today’s first Munro Top Sgùrr Choinnich Beag, with Sgùrr Choinnich Mòr in the background. 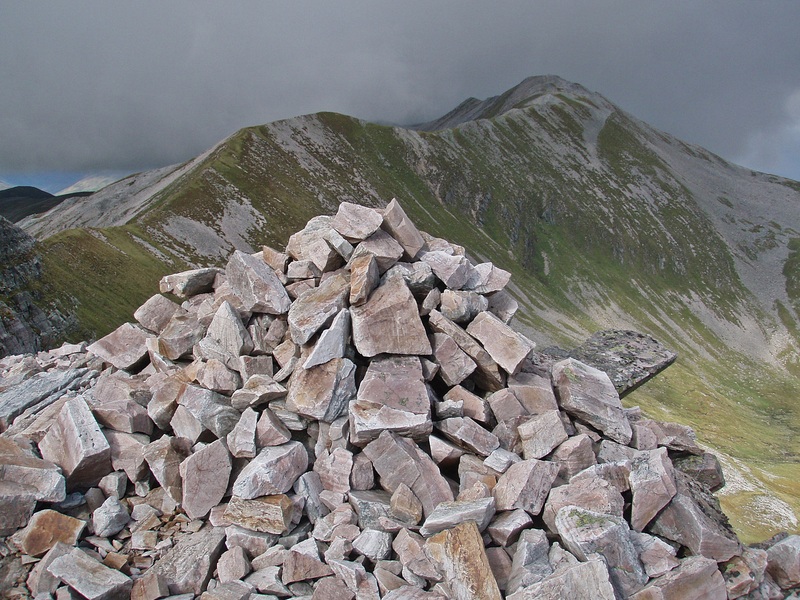 Sgùrr a’ Bhuic and Stob Coire Bhealaich. 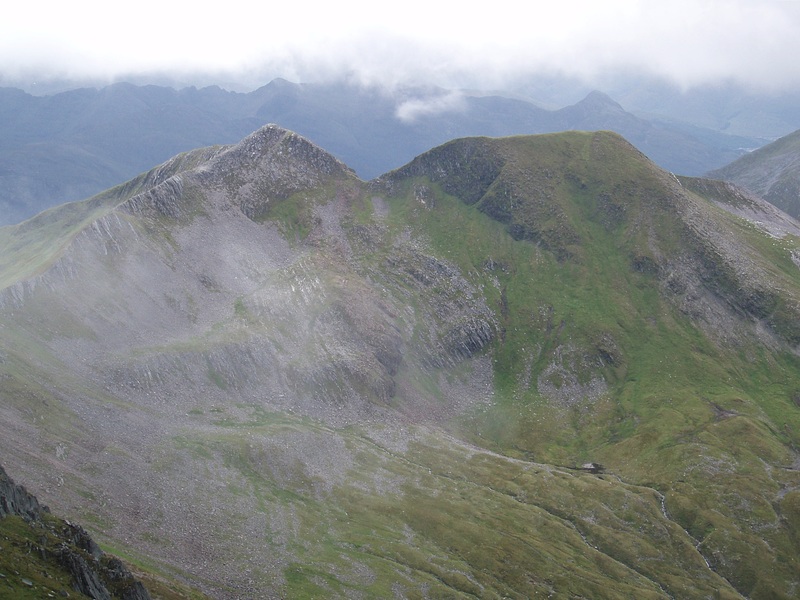 Looking across to Stob an Chul-Choire, one of Aonach Mòr’s Tops. 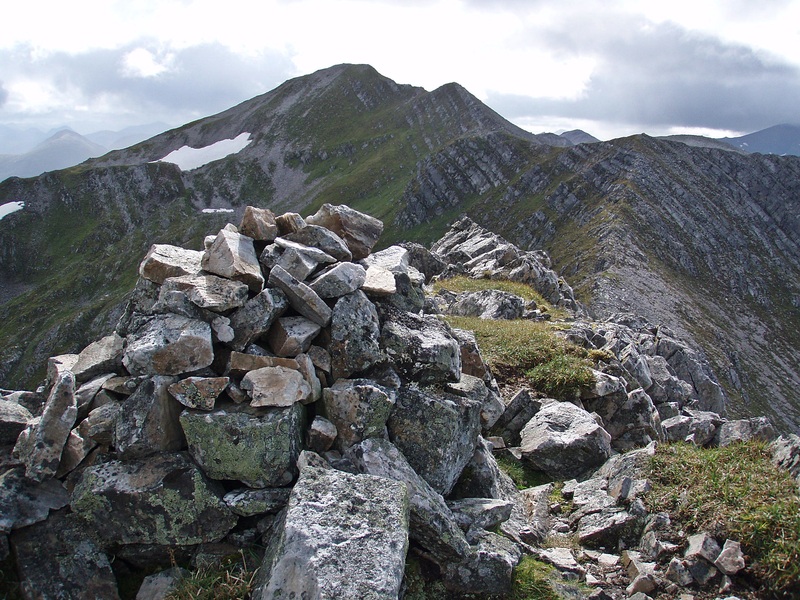 During my preparations for this walk I had found out about a rock tower blocking the way from the Munro to its Top and from the distance I tried to figure out a way around this obstacle, but I was too far away to make out any details in the complex terrain. 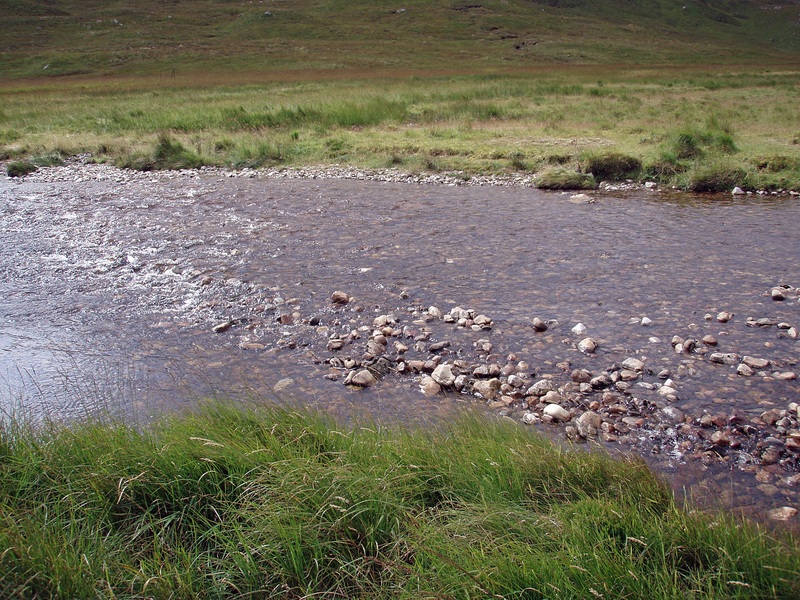 As I had run out of the water I had collected the previous evening I was glad to come across some clean running water in Coire a’ Bhuic. I took a long break by one of the streams, had a second breakfast, brushed my teeth and filled my water bottle. Above me to my right I saw the steep slope with the overhanging rock at the top that my fellow camper had descended and had advised me against – I could see why! A little bit further left I found this grassy rake which provides a much easier way to Sgùrr a’ Bhuic. 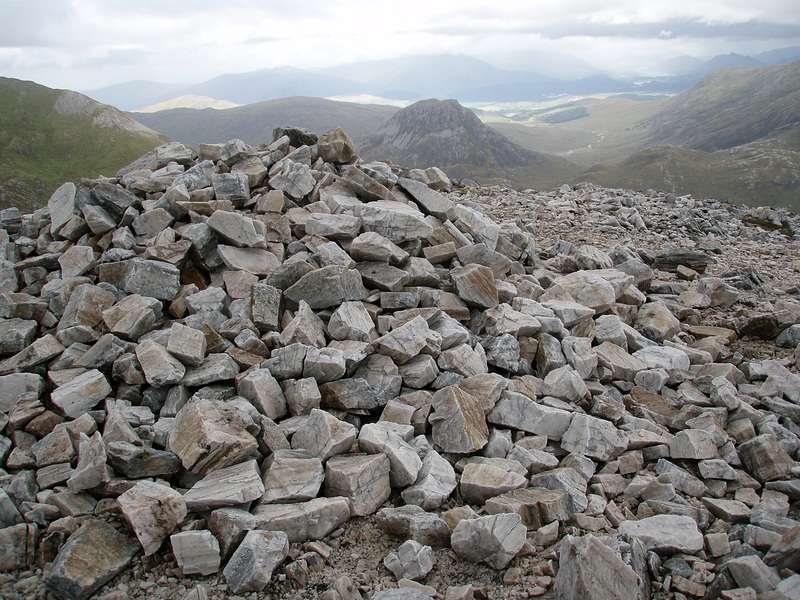 I left my rucksack at the top of the gully and made the quick detour to the rocky summit of Sgùrr a’ Bhuic. 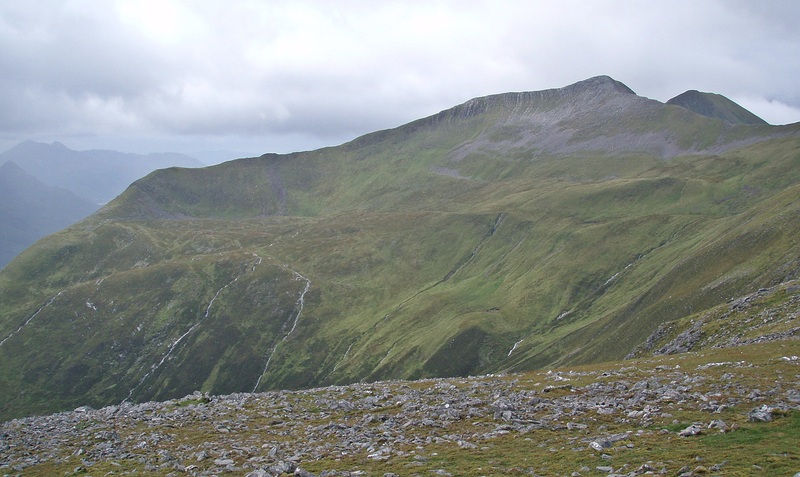 View back along the ridge I had come from this morning, with Sgùrr Choinnich Beag and Mòr in the centre. Sgùrr a’ Mhaim and the Steall Falls. 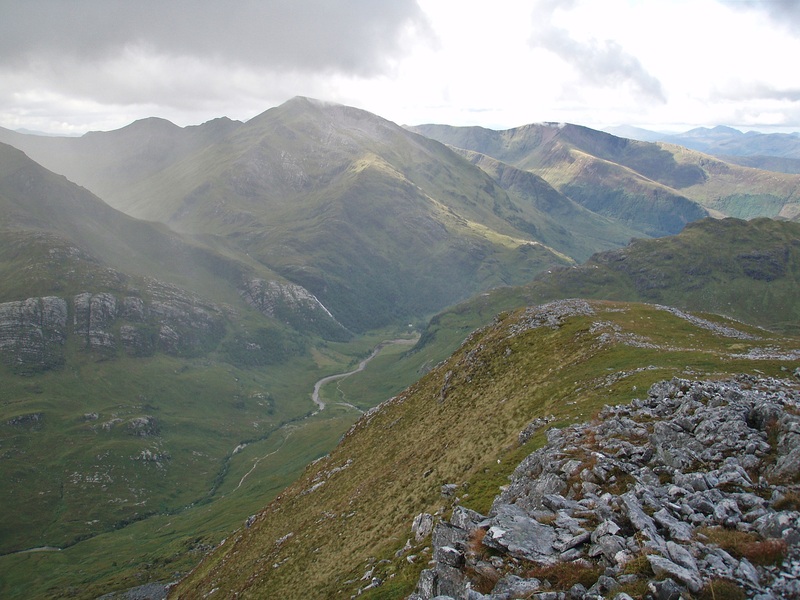 Another view along Glen Nevis. Ben Nevis hiding behind a cloud. 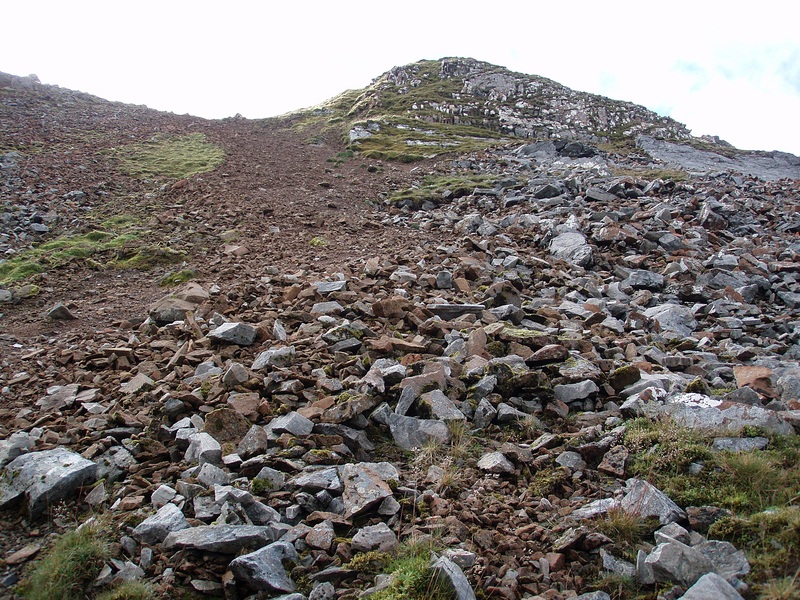 The ascent to Stob Coire Bhealaich. The overhanging rock at the top of the steep descent route (the one not to take…). Looking back to Sgùrr a’ Bhuic. On my way to Aonach Beag I met a couple who had neither map nor GPS and were unsure about the way ahead. 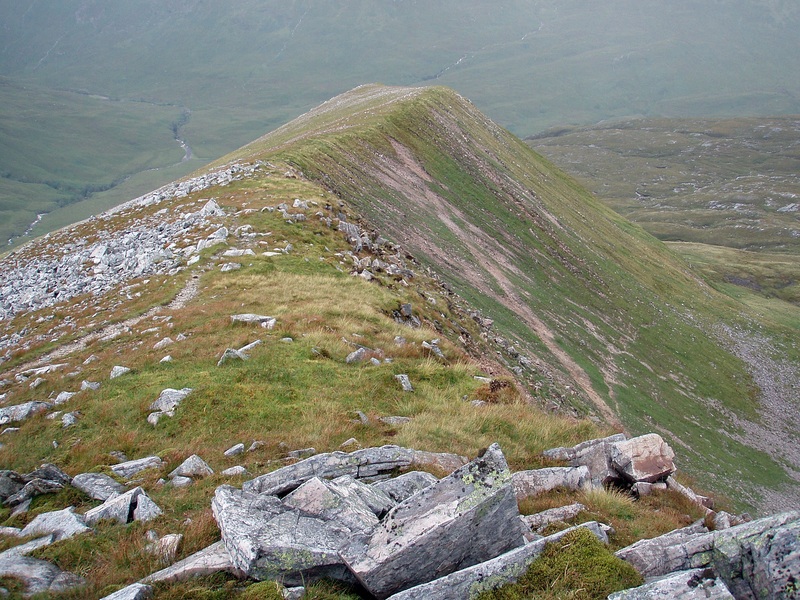 I told them that there was a clear path all the way to Aonach Mòr and in good visibility it shouldn’t be a problem. I would have walked with them but at this point I thought I had missed Stob Coire Bhealaich and went back to look for a cairn. 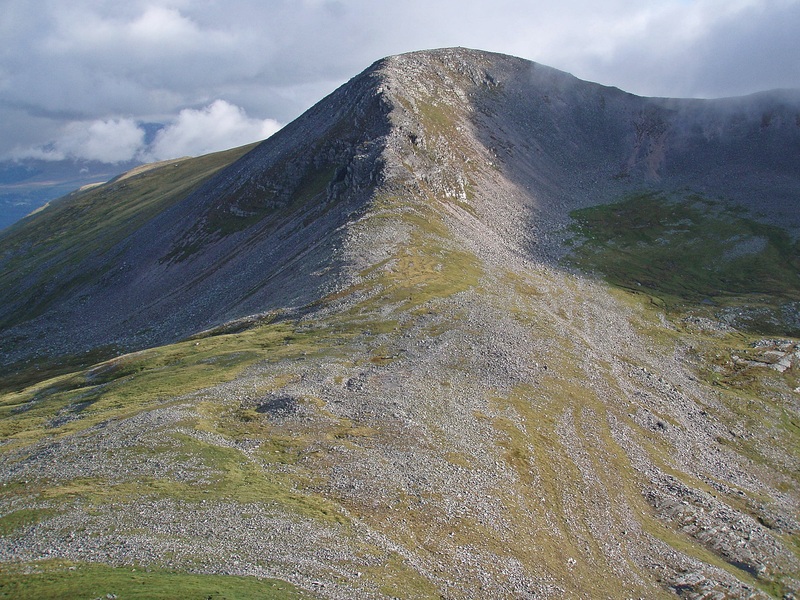 The 1048 m point I mistook for Stob Coire Bhealaich… no cairn, no Munro Top! In the meantime the clouds had descended and I saw the couple in the distance, on a bypass path contouring around the hill. They were too far away to hear me shouting but thankfully they realised they were on the wrong path and turned back. 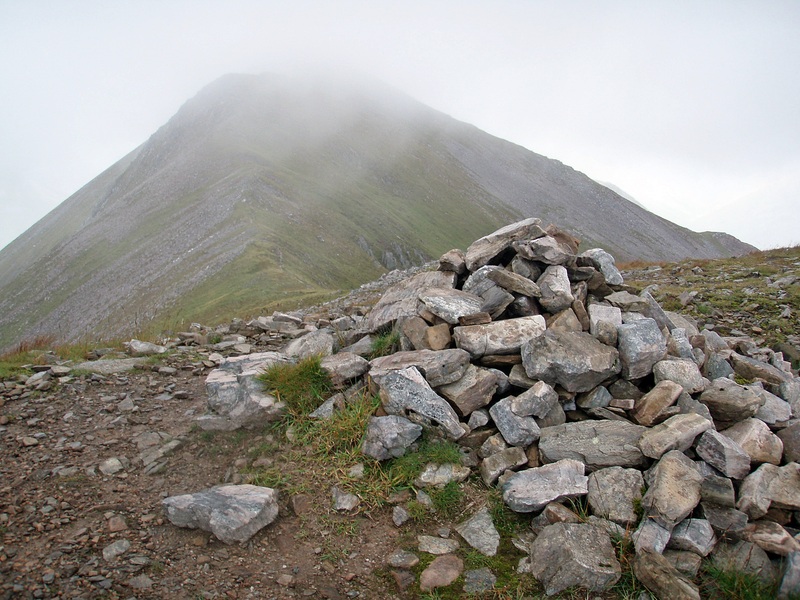 We walked the rest of the way together, chatting away and taking photos of each other but I completely forgot to take a summit photo of Aonach Beag. 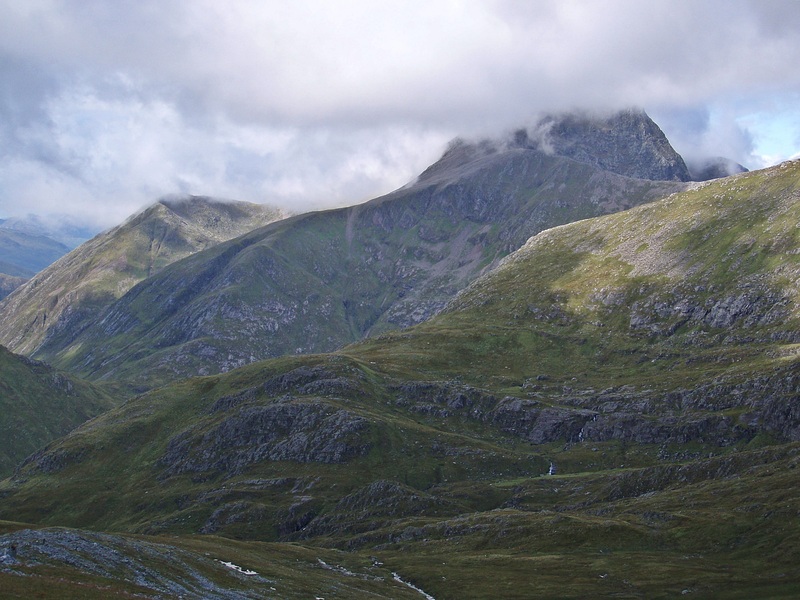 The bealach between Aonach Beag and Aonach Mòr. 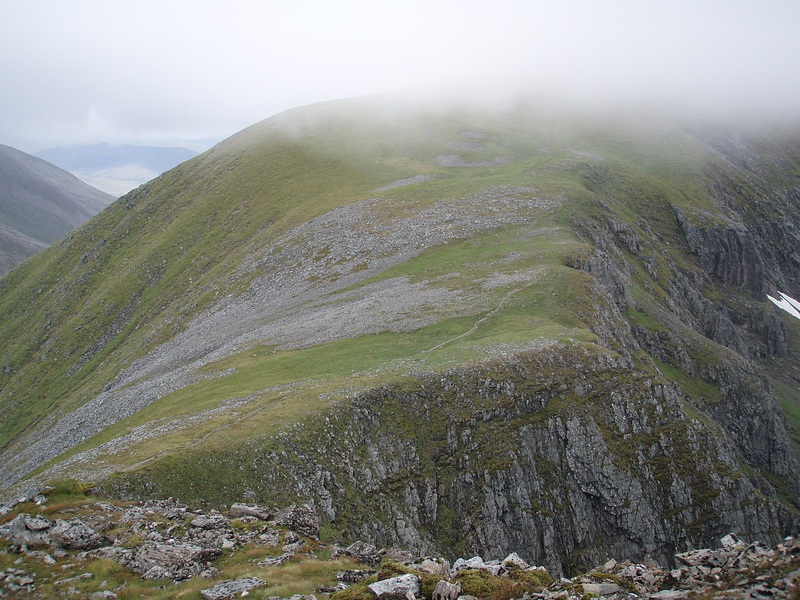 When we arrived at the summit of Aonach Mòr I described a couple of descent routes to them but recommended they’d return the way they had come up from Glen Nevis at it seemed the safest option, then we parted ways. 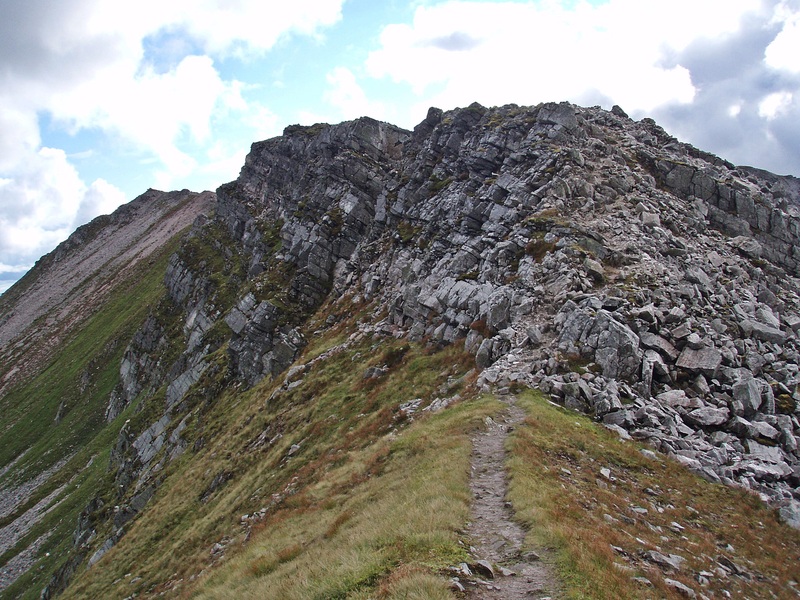 I left my rucksack at the top of the spur leading to Stob an Chul-Choire and tried to find a way down. Everywhere seemed far too steep and it took me several attempts to find a feasible route. Eventually I arrived on top of the infamous rock tower and spent some time trying to find a way down. It was getting late and it had taken me almost half an hour to cover about 200 metres, so I decided to give the two Munro Tops a miss. 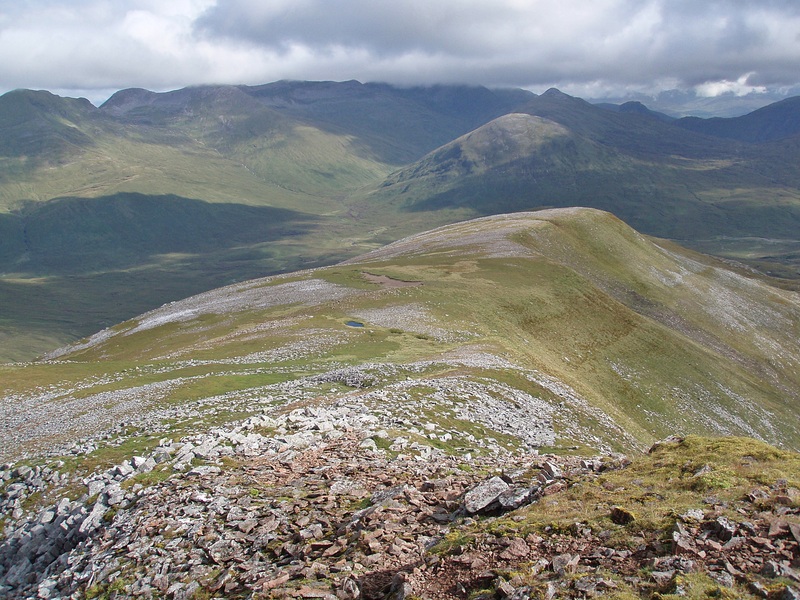 I returned to the summit and walked along the edge of the plateau, with great views down into the glen to the west. 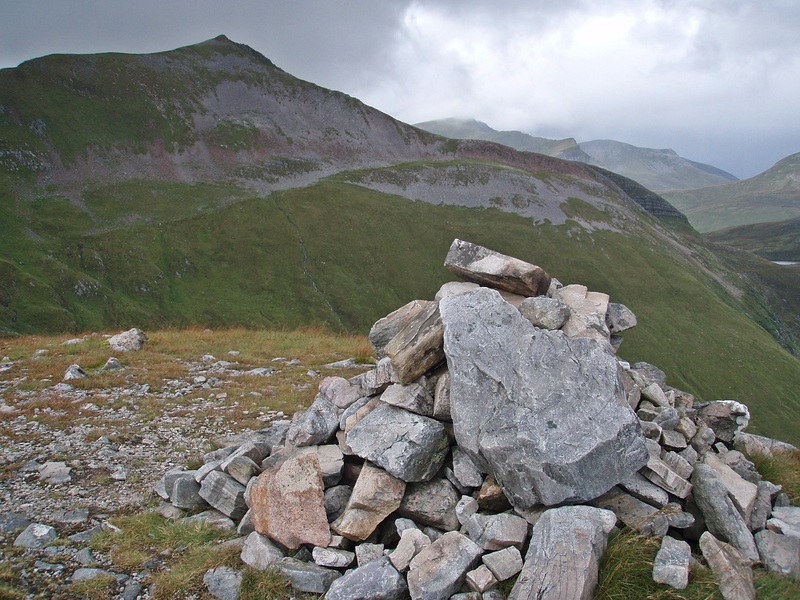 Soon I found the cairn marking the descent to the bealach between Aonach Mòr and Carn Mòr Dearg. The path is quite steep and loose in places but altogether not as bad as I remembered it. On my way down it started to drizzle and I was glad to find a good camp site on the bealach and put my tent up. I made it into my tent just seconds before the rain became heavier and it kept raining heavily during the night. It was freezing cold in the morning and after brushing my teeth and a quick wash in the stream, my hands were numb. But it was sunny with hardly any wind when I started walking at 09:00. 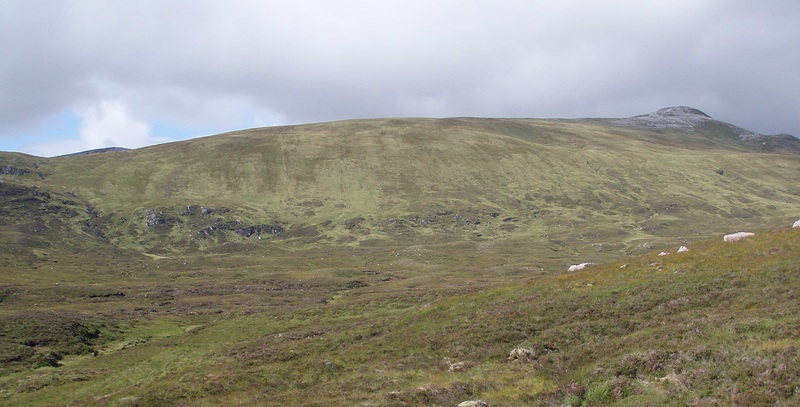 The faint path up to Carn Mòr Dearg starts beside the remains of a drystone wall. 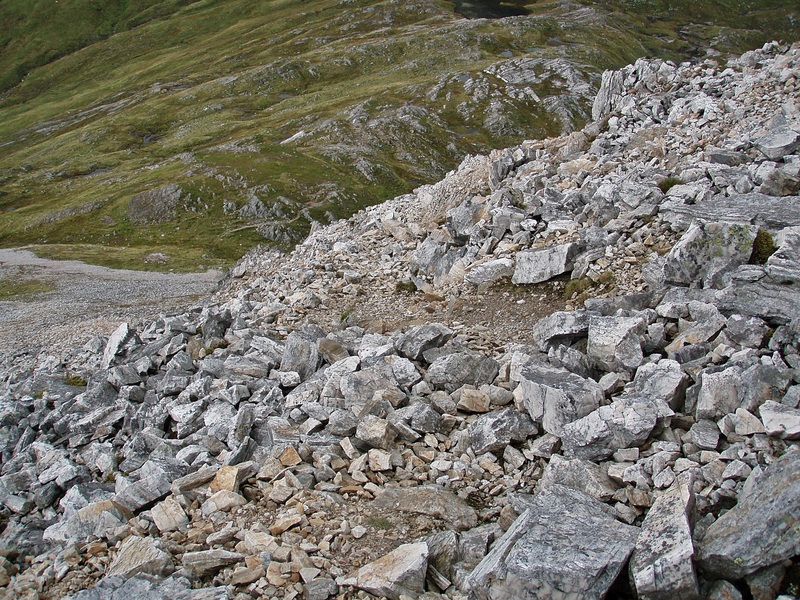 At first there are some steep and scrambly sections over large boulders to negotiate. After that it is a pleasant walk along a nice narrow ridge. 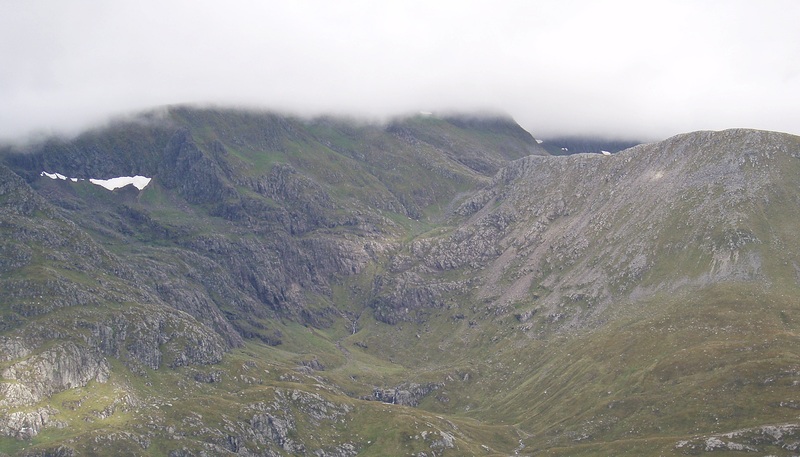 Coire Giubhsachan and The Ring of Steall. 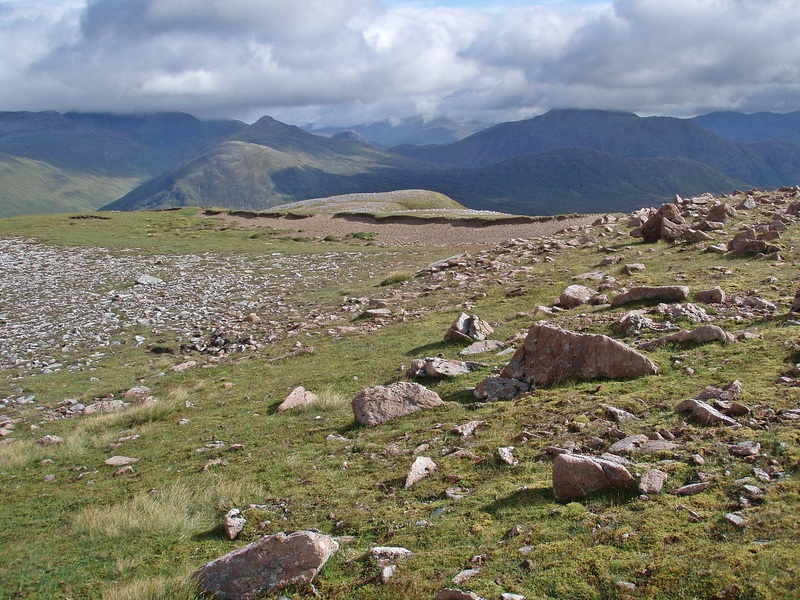 Looking back to Aonach Beag. 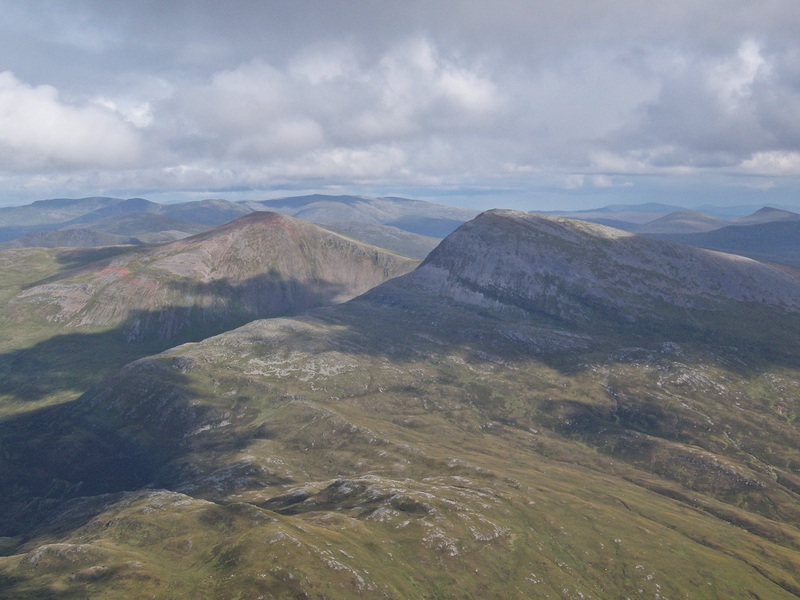 I left my rucksack by the summit of Carn Mòr Dearg to make the quick detour to Carn Dearg Meadhonach. 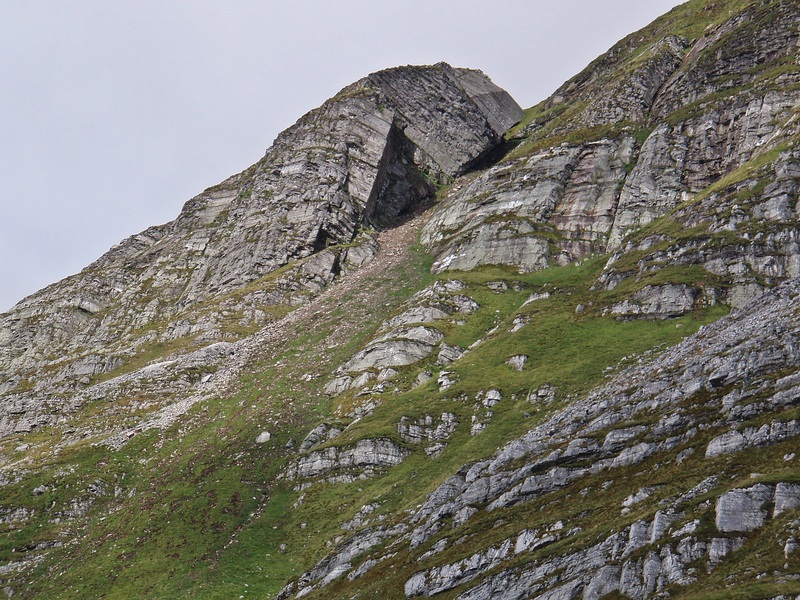 … and the Ledge Route and Castle Ridge on the right. 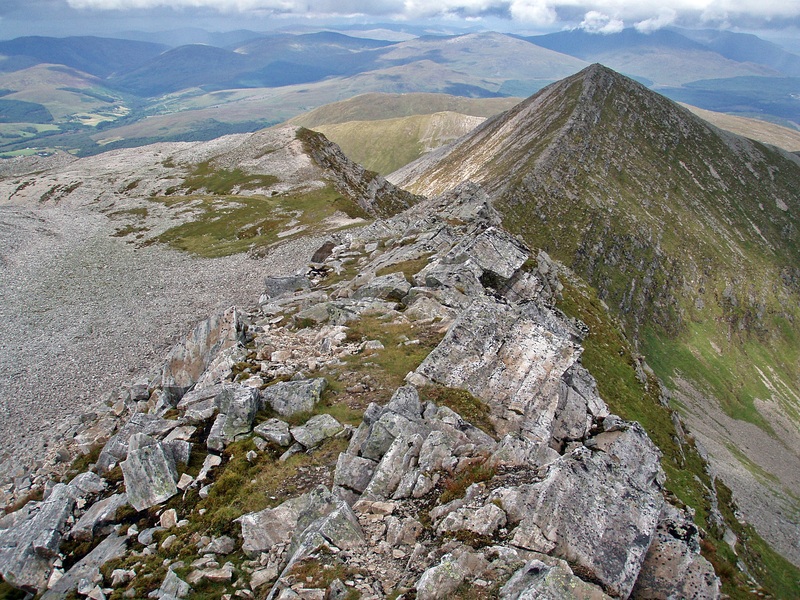 Hard to believe now that I once thought that Ben Nevis was a boring hill! It was very warm by now and I met several walkers wearing shorts and T-Shirts (while I still had my leggings on under my trousers because it had been so cold in the morning…!). Back at Carn Mòr Dearg I collected my rucksack and started walking along the Arête. 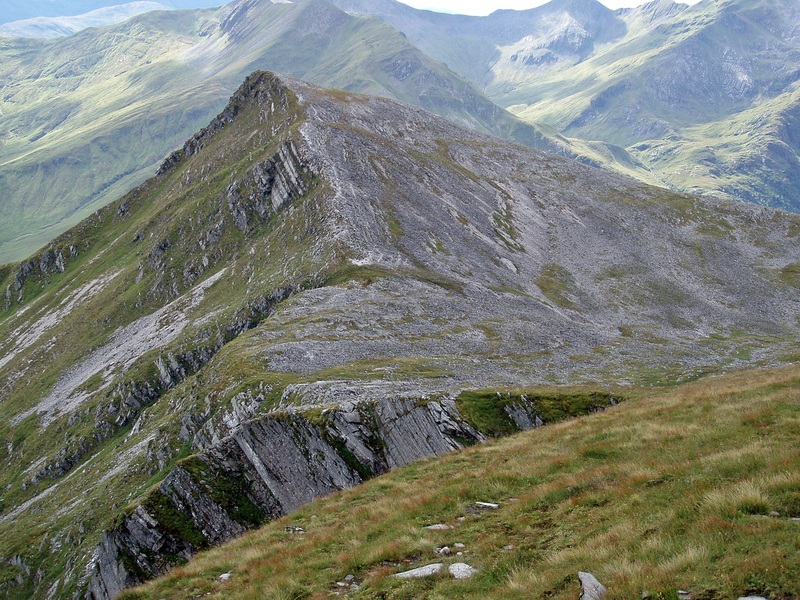 I have walked the CMD Arête a few times before but never with a big pack. It wasn’t too bad but I found some sections awkward with the extra weight on my back and so I used some of the bypass paths instead of keeping to the crest of the ridge. 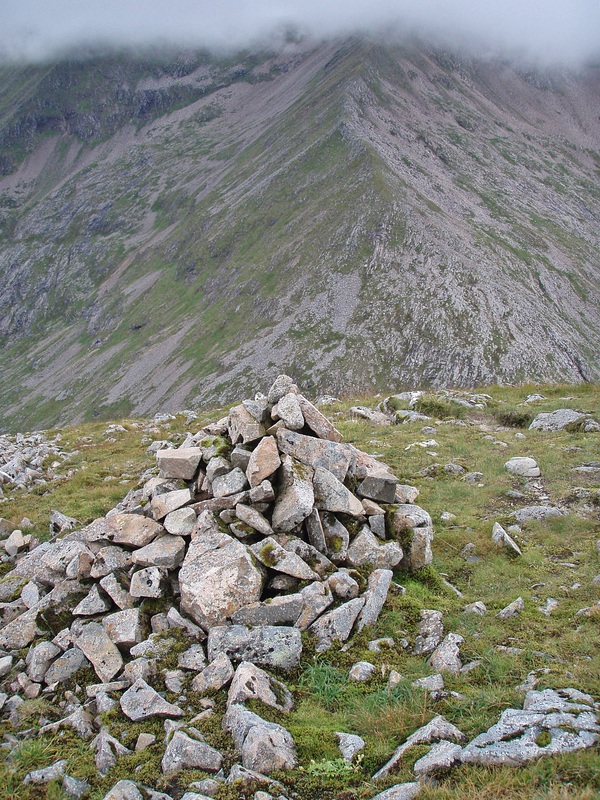 Cairn at the site of the former abseil posts which were removed in 2012. 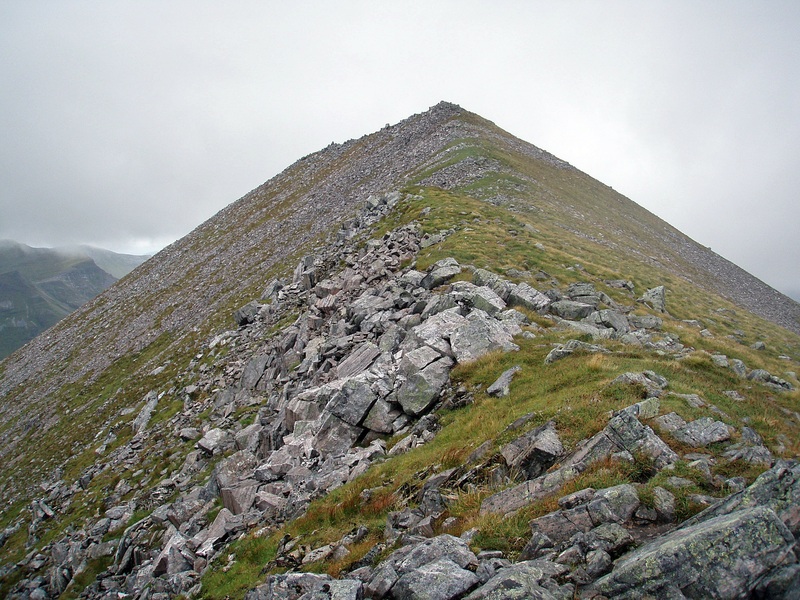 Now there was only one more obstacle – the unavoidable boulder field before the summit. 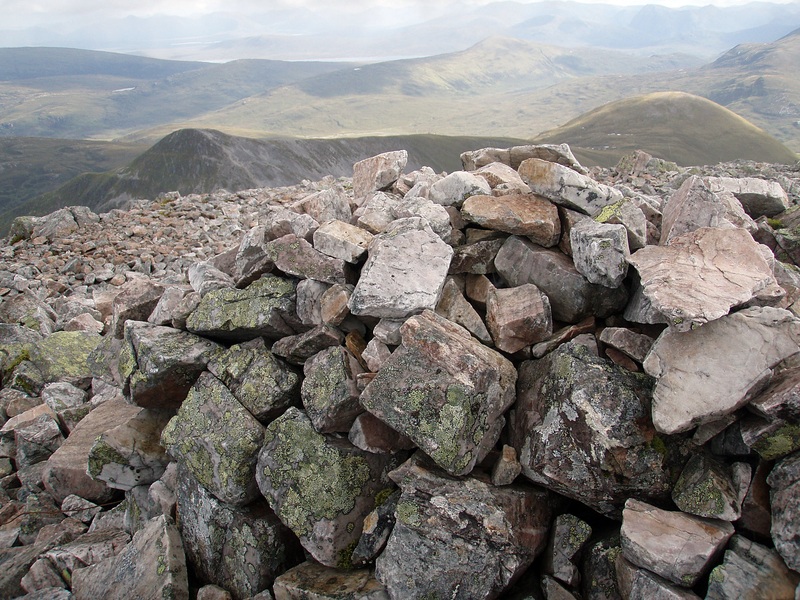 I reached the plateau at 14:00 to find the usual fun-fair atmosphere, and after a bit of queueing to touch the cairn I quickly left the summit area. 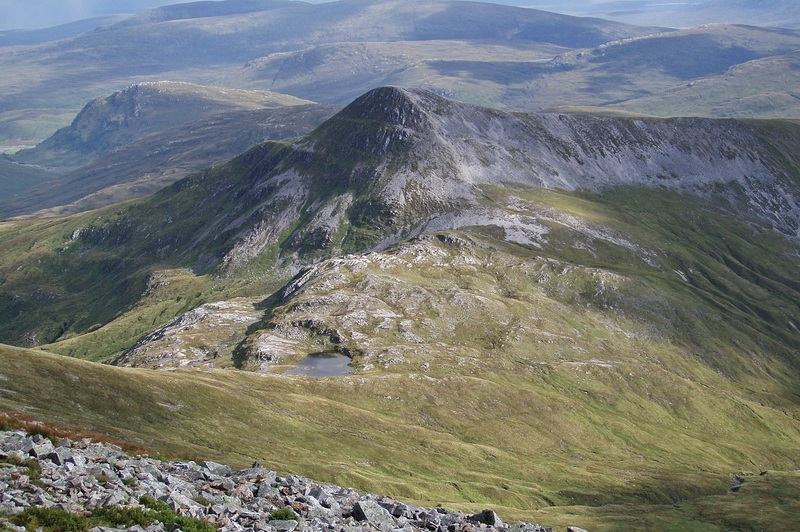 My next target, the Carn Dearg NW Top with Tower Ridge in the foreground and the Ledge Route at the back. 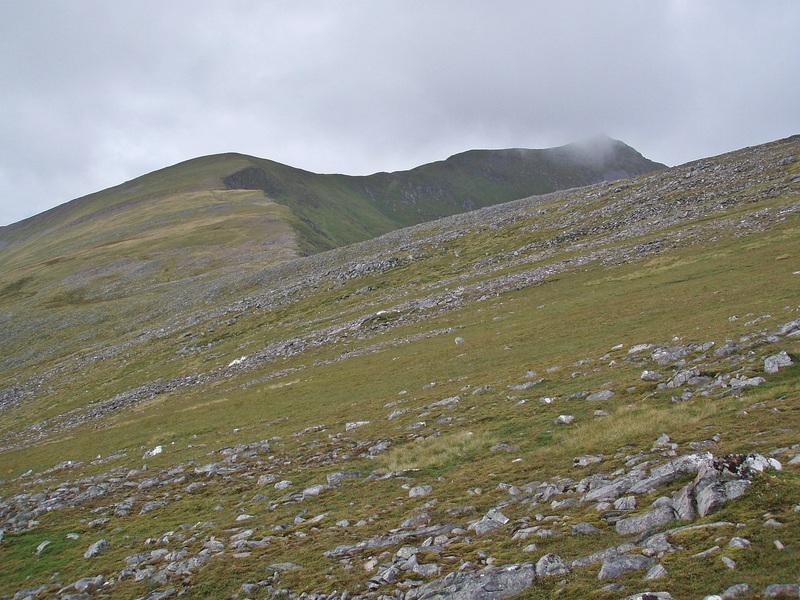 Approaching Carn Dearg NW Top. There is a number of shelters and cairns at the top and I couldn’t tell which one was the highest so I visited all of them. 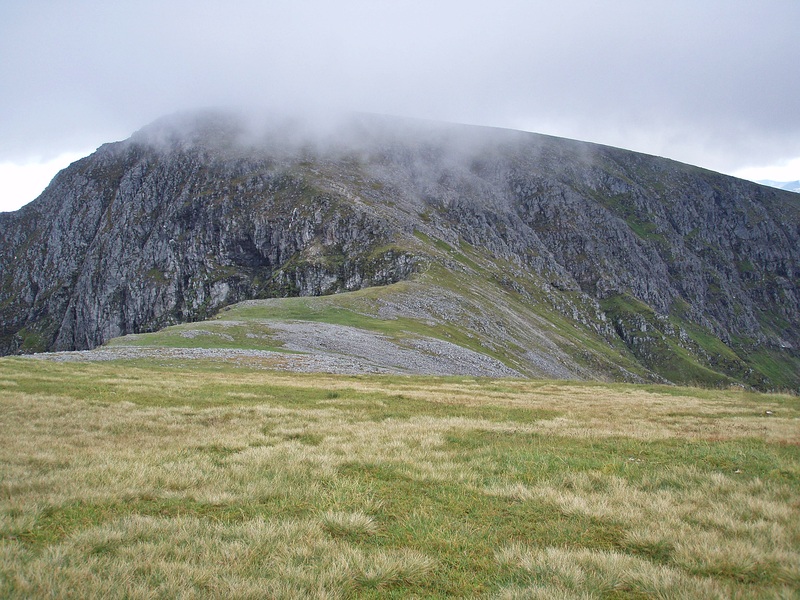 On my way to the next Top, Carn Dearg SW, I made a slight navigational error and descended too far along the zigzags, ending up above Five Finger Gully. At least I got a good view of my next Munro Top from here! 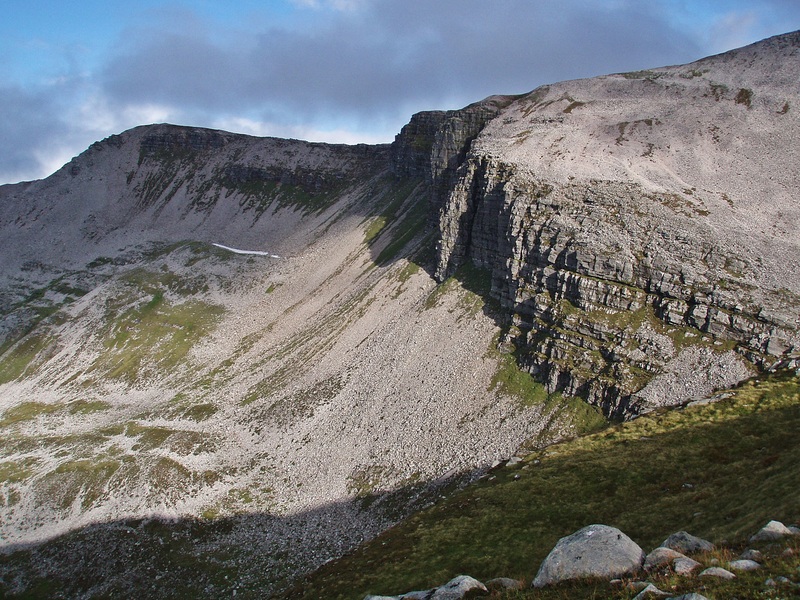 After climbing up a good distance I found the correct route, left my rucksack again and descended a scree slope to reach the nice grassy ridge leading to Carn Dearg. On my way back I sat down for a break at the bottom of the scree slope. 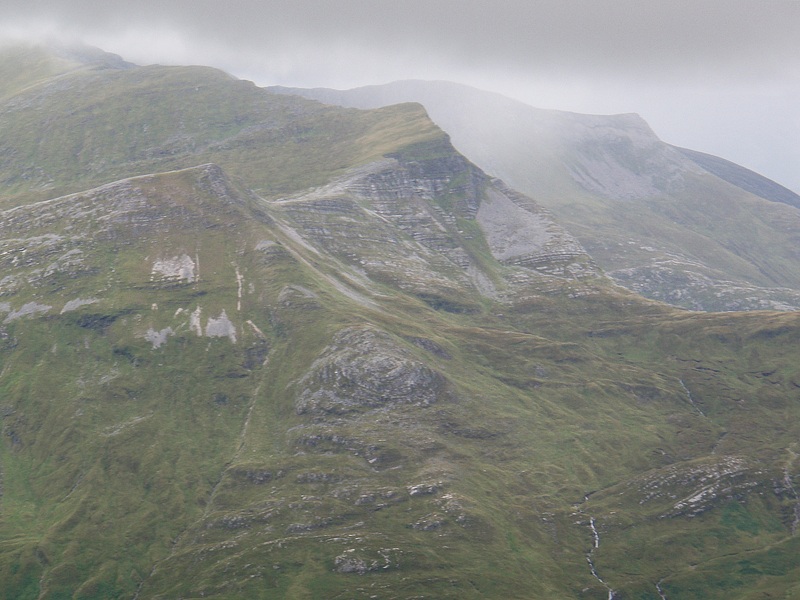 Looking around I spotted two men in the distance spreading out what looked like large groundsheets or tents at the side of the bealach before Carn Dearg. This seemed somewhat strange considering the time of day and the location, and eventually I realised that they were paragliders preparing for a flight. Unfortunately I could only catch a glimpse of them lifting off before they disappeared out of sight into Glen Nevis. 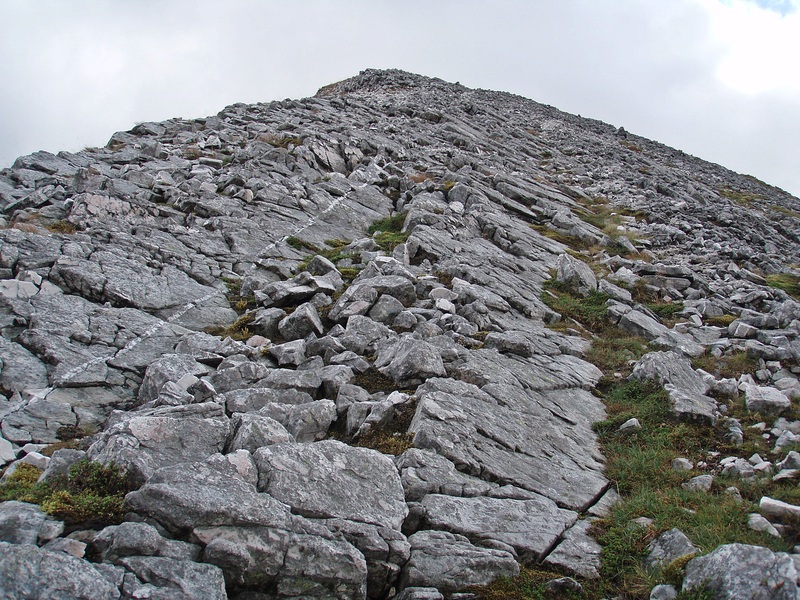 I climbed back up the slope, picked up my rucksack and followed the zigzags down. At first I thought I could make it back to my car to do some food shopping at Morrison’s before closing time, and so I tried to descend as quickly as I could. 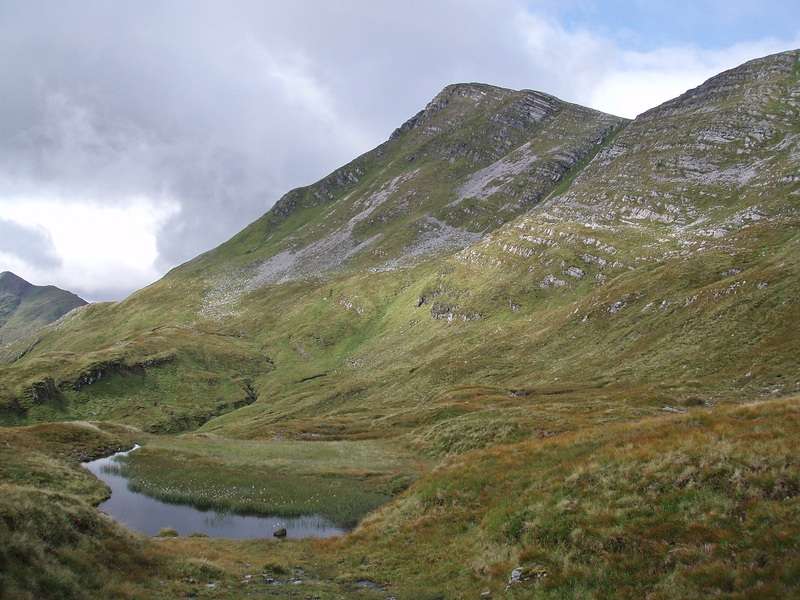 As a result my knees became very sore, and rather than limping down the hill in increasing pain I decided to camp by Lochan Meall an t-Suidhe and descend to the Youth Hostel (and my car) the next morning. I arrived at the lochan at 19:30 and put up my tent in warm and calm conditions, surrounded by swarms of midges. As this was an unplanned camp I didn’t have any evening meals left, and so my dinner consisted of a couple of chocolate bars and mini Babybels. 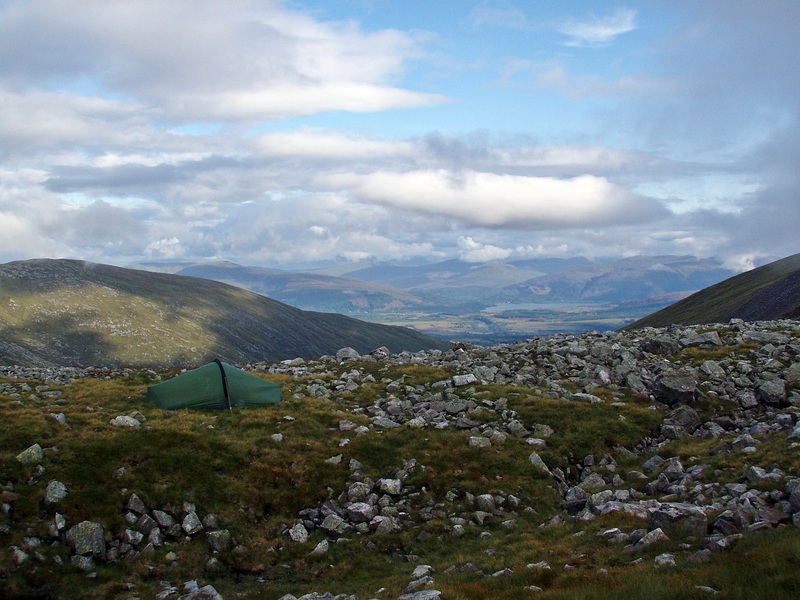 It was extremely windy when I packed up my tent in the morning but at least the midges didn’t bother me! On my way down I came across the usual mix of well-equipped walkers and others not even carrying a rucksack. I was wondering if they would make it to the summit without any warm clothes, considering that it would probably be a lot windier and colder at the top than it had been at the halfway-lochan. I arrived at the Youth Hostel at 10:50 to find the reception closed so I drove down the road to the Visitor Centre for a quick wash and to change clothes in the washroom. Next stop was the Grog & Gruel where I had pizza, cheese & garlic bread and a cider which was bliss after I had almost run out of food on the hill! Then I used the free internet access at the library to plot and print out tomorrow’s route over Aonach Mòr and its two Munro Tops (at the time I was planning to walk up from the car park at the ski centre). After some food shopping I drove back to the YH where I booked a bed for the night, had a shower, washed my hair and spent the rest of the day relaxing – and eating! Over night laziness had taken over and I had decided to make use of the Nevis Range Gondola instead of walking all the way from the car park. 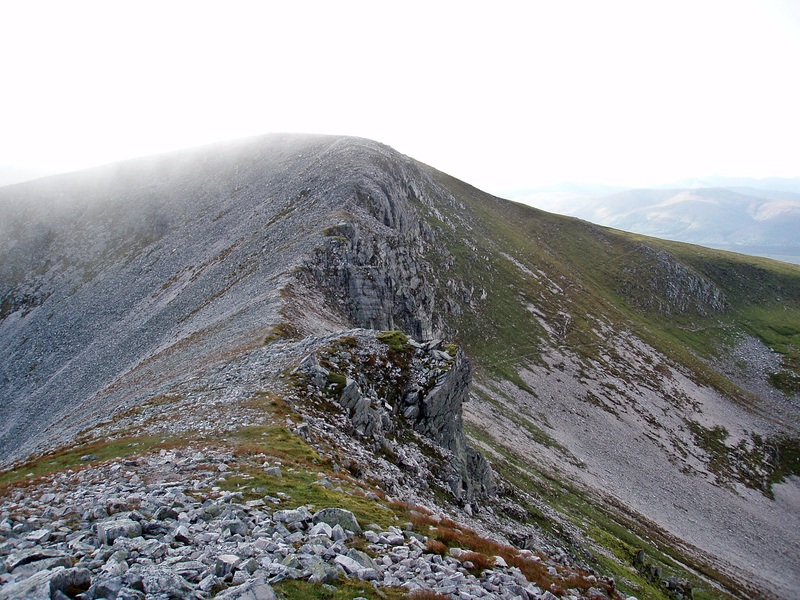 I had convinced myself that this wasn’t cheating as I had already climbed Aonach Mòr properly three days ago…! From the Gondola top station I contoured around the hill into Coire Choille-rais. 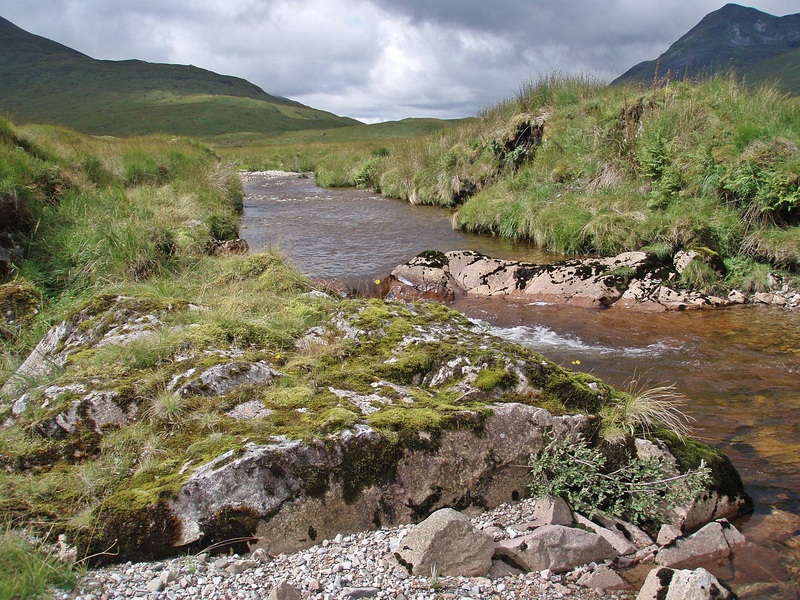 I forded the Allt Choille-rais easily on stepping stones, below some impressive crags. There are plenty of potential camp sites on both sides of the meandering river. To avoid the rocky W face of Tom na Sròine I ascended the grassy slope leading to the bealach S of it and climbed the Top from there. On my way up I stopped for a break and to enjoy this wonderful sunny and warm day. Looking back to Tom na Sròine. Stob Coire Easain and Sgùrr Choinnich Mòr, with Bealach Coire Easain, Friday night’s camp site, in between. A nice airy section on the ridge between the two Tops. 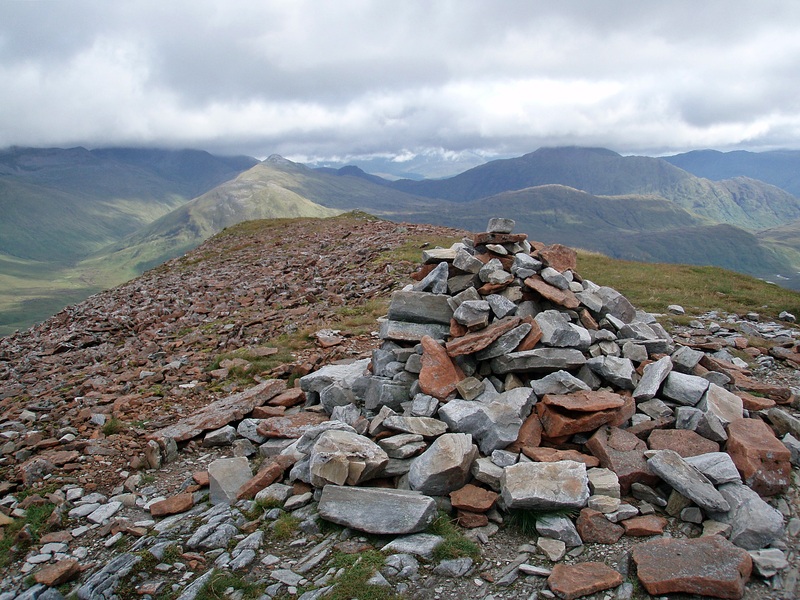 The summit of Stob an Chul-Choire, today’s second Munro Top. 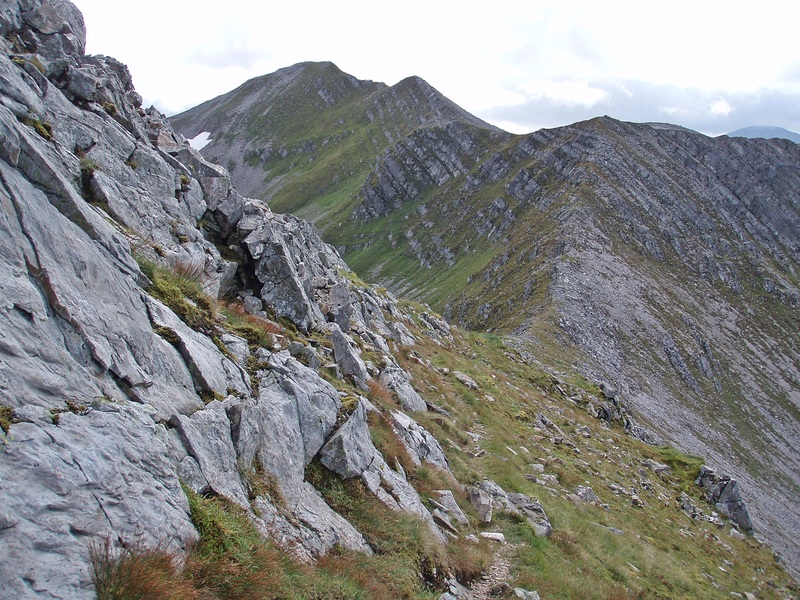 Aonach Beag’s steep and rocky NE ridge. I was slightly apprehensive about the way ahead, considering that I couldn’t find a way down the connecting ridge three days ago. But then again, “dodgy bits” are normally easier in ascent! 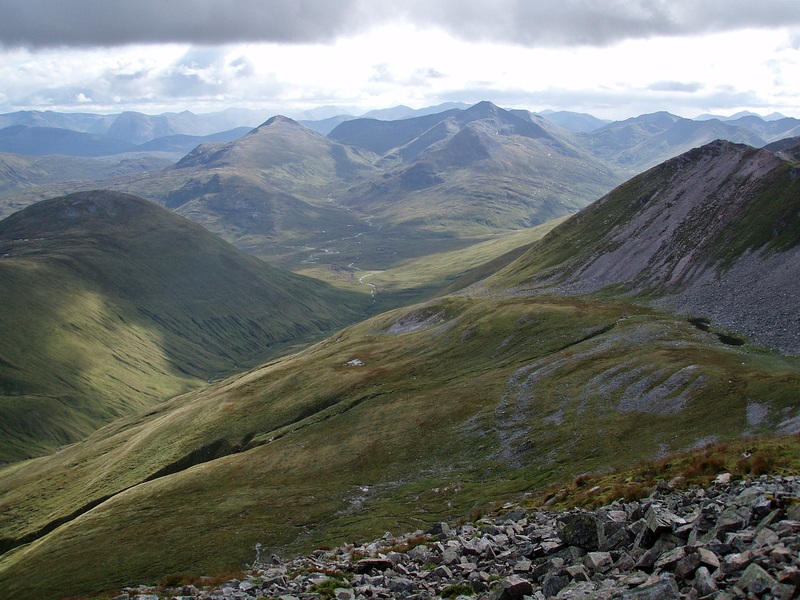 View back to Stob an Chul-Choire. 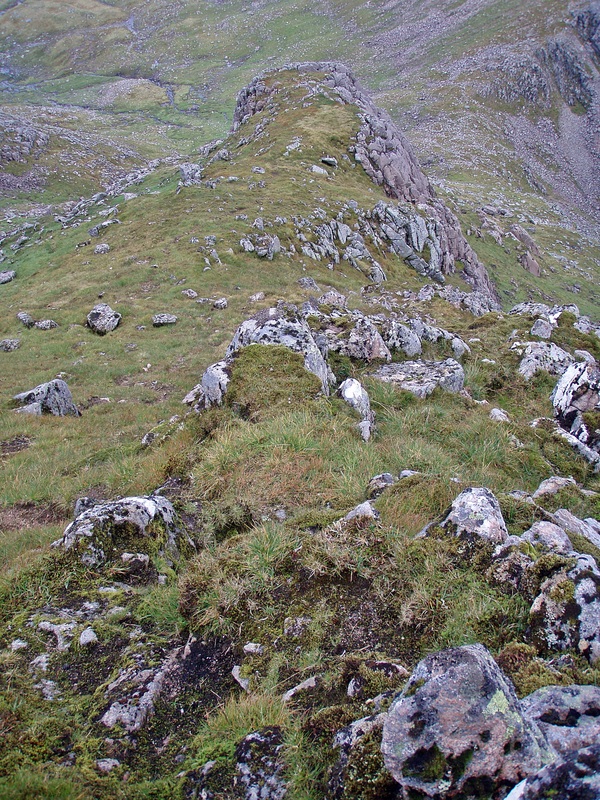 Sgùrr Choinnich Mòr and Beag above Coire Bhealaich. My worries had been unfounded as, approaching it from below, I could see a faint path bypassing it on the right. This bypass is not easy to find from above but there really is a way down on the left (in descent). As I approached the summit of Aonach Mòr from this unusual direction I surprised the only other hillwalker I had met all day. 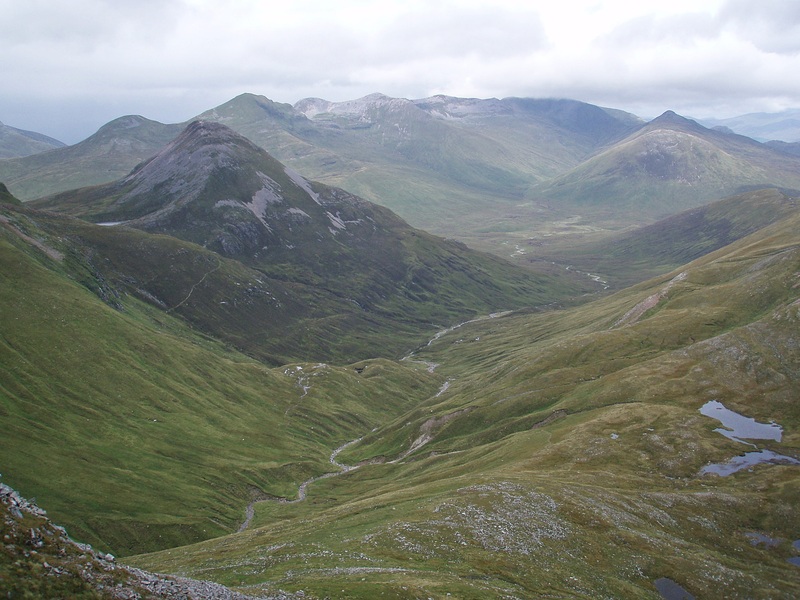 The glen W of Aonach Mòr. 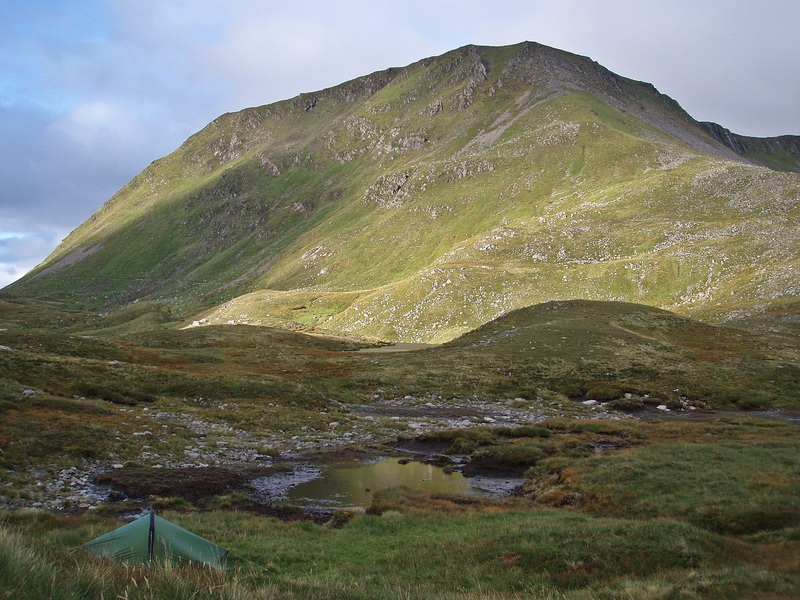 The bealach above Coire Giubhsachan where I had camped on Saturday night. 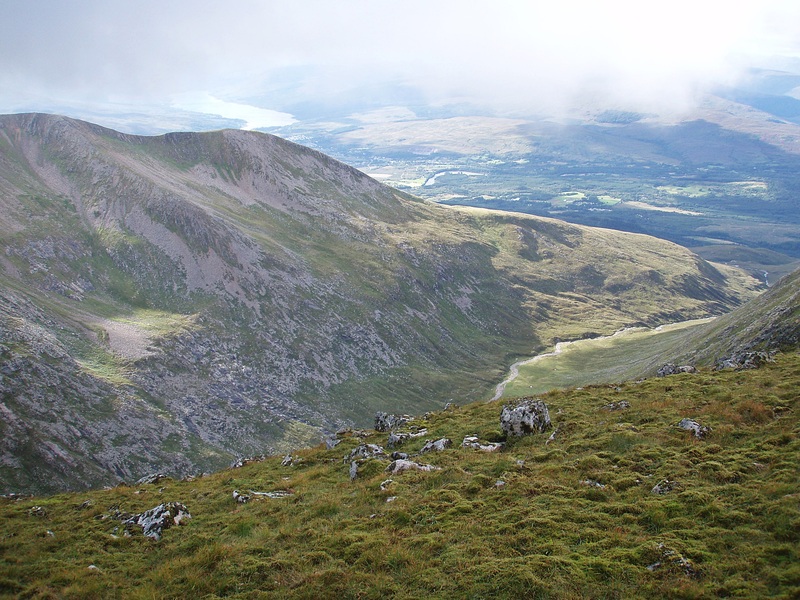 I descended along the easy-angled N slopes of Aonach Mòr. Surrounded by the various ski tows and chair lifts, I didn’t find this side of the mountain very attractive but at least the distant views were nice. I celebrated the end of a successful holiday with cake and caffè latte, sitting in the sun on the terrace of the Snowgoose Restaurant. The return trip on board the Gondola. Although I did this trip in several portions it felt like a great achievement to have finally completed it. To think that hill runners do all this in less than 24 hours (the current record stands at an unbelievable 11:31)! 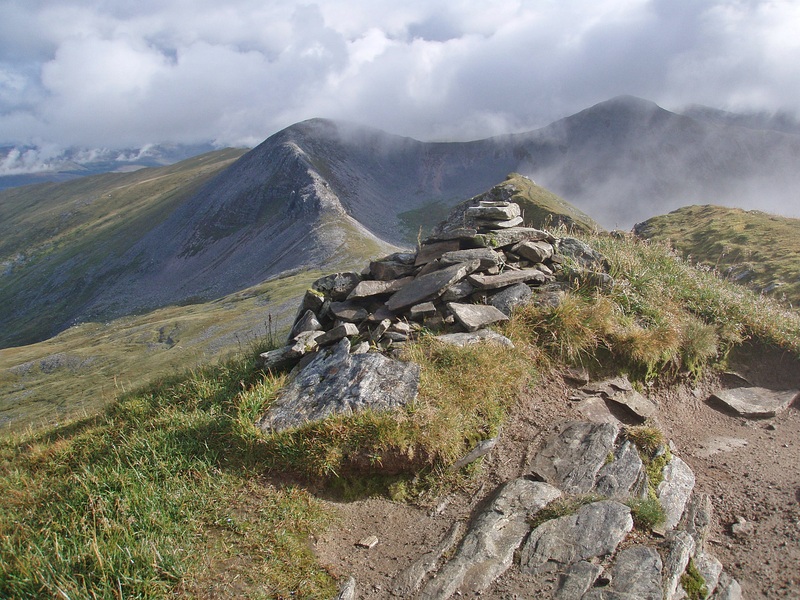 I am glad I did it as a backpacking trip at a much more leisurely pace, and including all the Munro Tops as well. 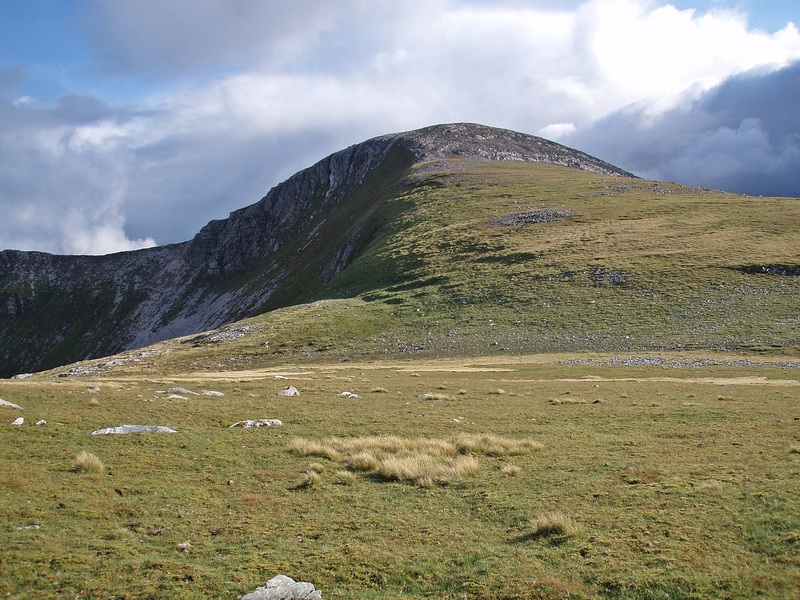 I feel that I got to know these hills a lot better this way than on my previous day walks, and the camp sites were amazing – even if they were not summit camps. Enjoyed reading that and looking at the pictures. Thanks for sharing. I’ve been using the original version of the Salomon X Ultra Mids and found them to be excellent. I’m with you, mountains are best enjoyed at the dawdle, why do something in 24hrs when you can spend days. The only problem is the weather, it’s more likely to get one good day than several in a row! 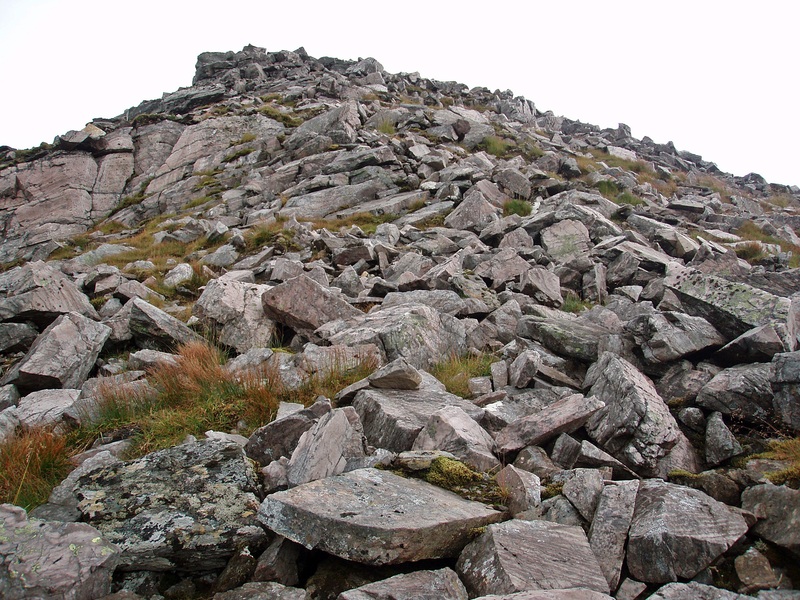 I steered well clear of that horrid-looking loose and steep path up Sgurr Eilde Mor – it looked awful. I went straight up from Loch Eilde (Mor?) 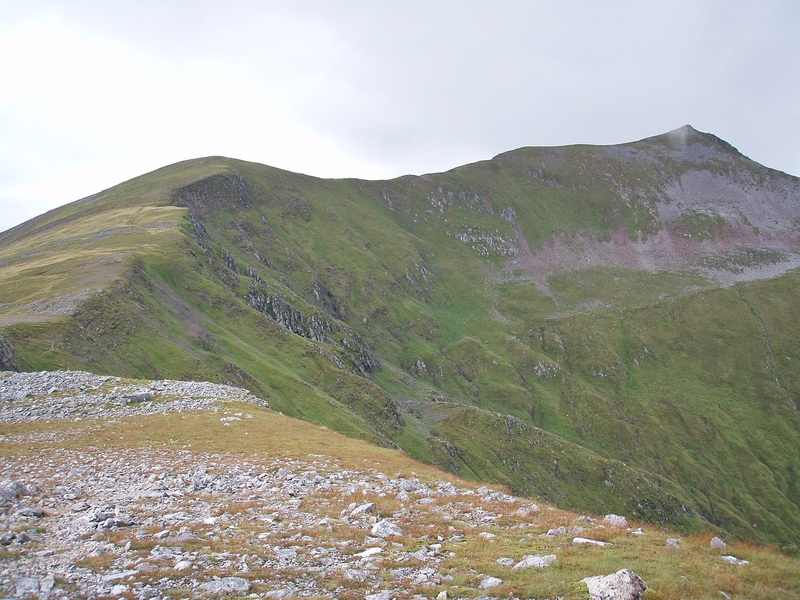 and then along the long ridge and down the side of that when it got lower to pick up the track to Binnein Beag. I didn’t like the look of the steep and loose descent from Stob Ban either and was glad I was doing the peak on it’s own one winter! I’m surprised if you’re getting on okay with the men’s boots – the heel will be wider than a ladies – that always wears my socks out within a day or so! I’m on Vodafone on my hill phone and almost always get a good signal in Scotland. 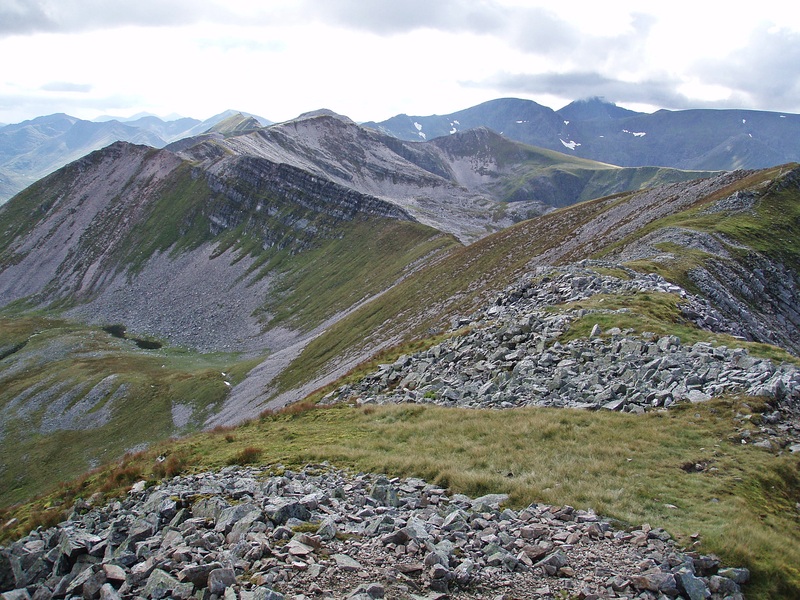 I love the Grey Corries – one of my favourite sets of Scottish mountains. I especially liked Ceannain but found the descent from Claurigh to it a bit scary in places – fine going up and down Ceannain though. 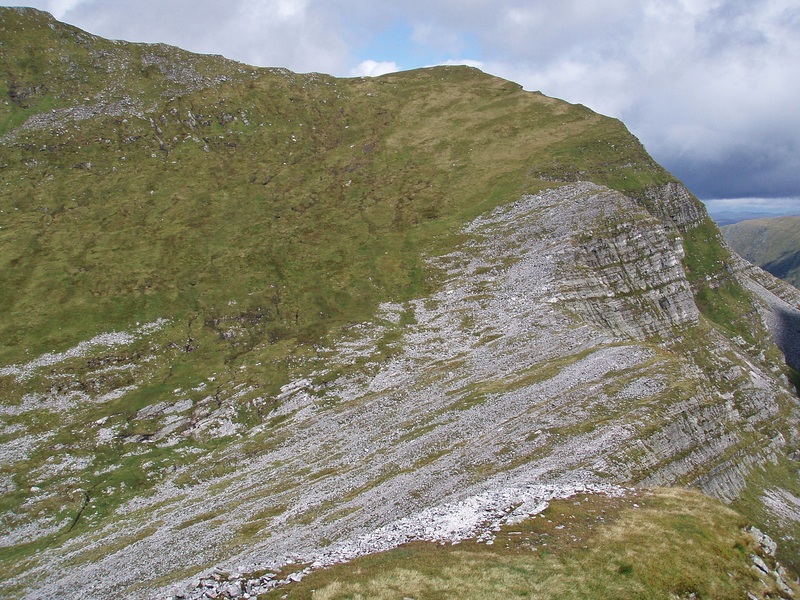 We got fed up of the descent from Easain and descended the side of the rocky ridge – I think most people did that day. I didn’t realise it just ‘gave up’ in the end! 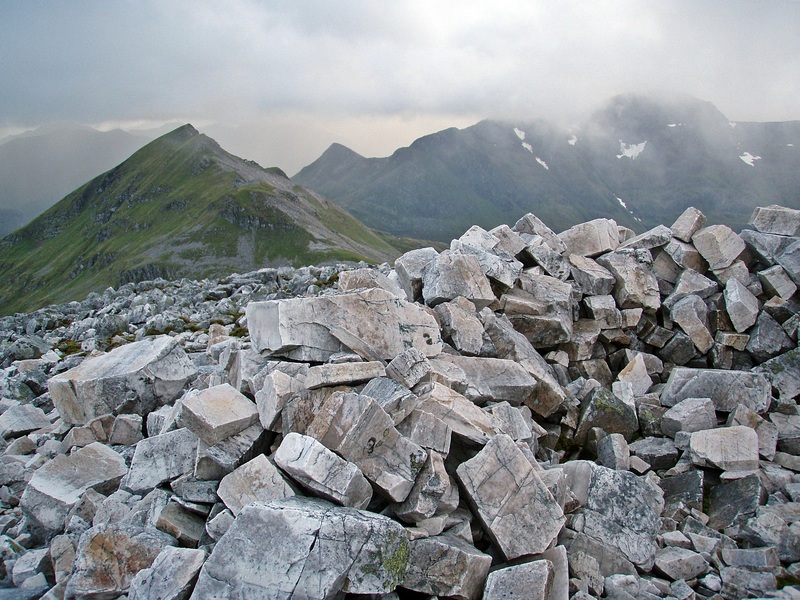 Lot of exciting stuff leaving the Grey Corries! 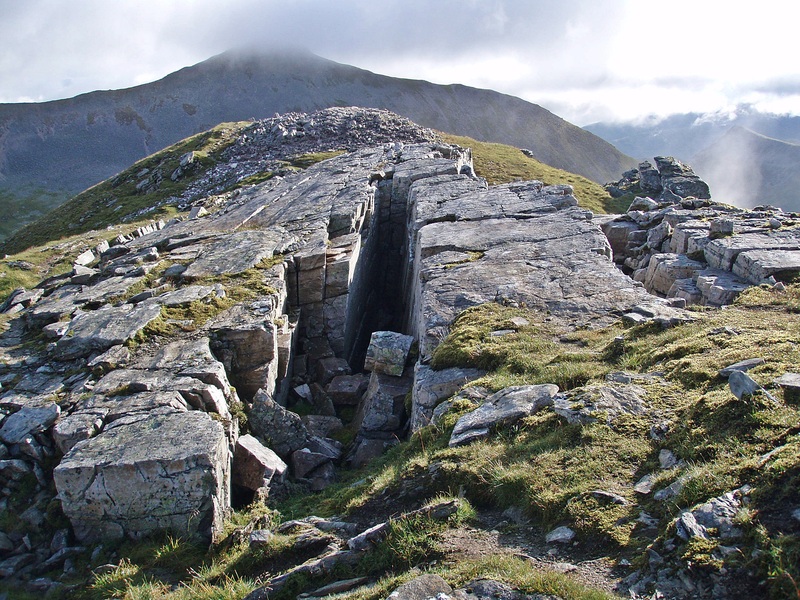 and great photos 🙂 I always wondered how you got from the Grey Corries onto Sgurr a’ Bhuic and co and knew of folk who’d had to crawl on their bellies going up under that overhang. Now I know anyway! 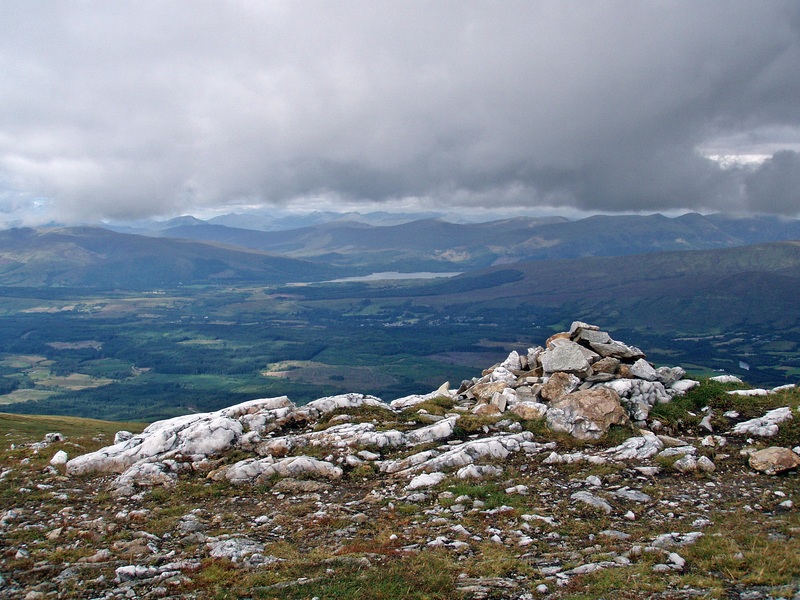 Couldn’t you get down the rock tower to the Aonach Mor tops on the left? It looked okay from the photos (although I know that isn’t the same as being there). 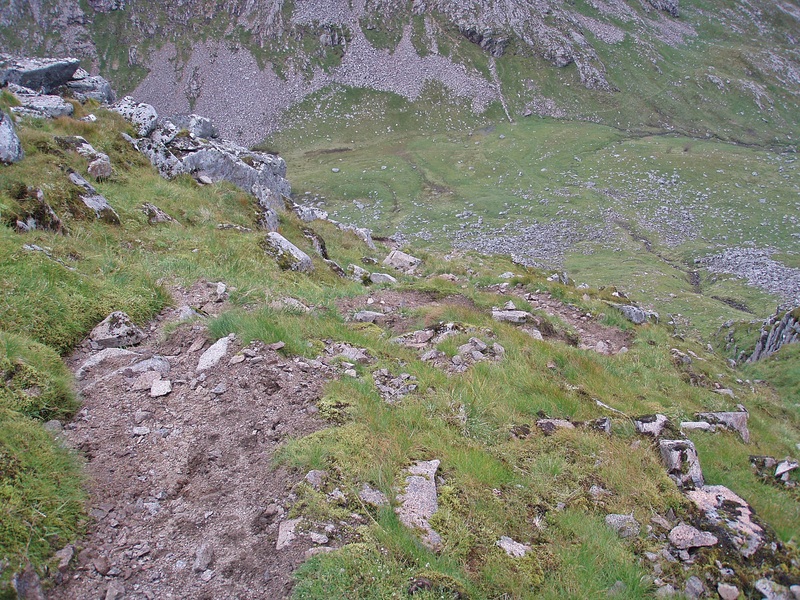 Never fancied that path down from Aonach Mor to Carn Mor Dearg! Very steep and loose-looking. Yes the route past the rock tower does go around to the left but I didn’t find a feasible way down on my first attempt, it all looked far too steep and slippery. This bypass is a lot more obvious from below, and easier in ascent as well I suppose. 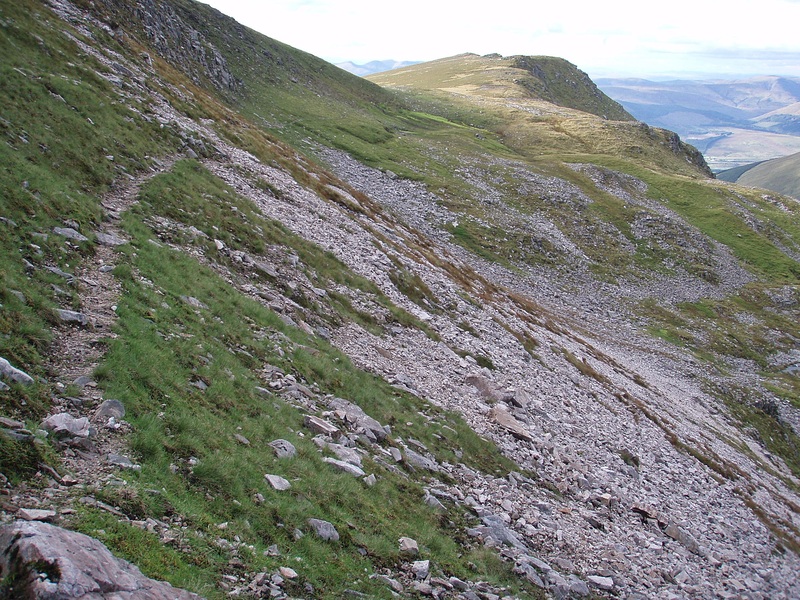 The path from Aonach Mor to the bealach where I camped is very steep in places but not that bad if you take your time. I wouldn’t attempt anything like that without trekking poles, though. Absolutely stunning photos of the CMD and The Ben’s North Face! What camera do you use? My digi-camera is hopeless for landscape shots and they always come out very unsharp. Looking at your photo looking back to Aonachs Mor and Beag – I’ve no idea where your path came down – it all looks horrific! I turned back the time I tried to do the CMD – at the first corner. The next section was presenting sheer crags to me and I thought it would be narrow. Richard continued on his own. Next I saw of him, he was strolling along with his hands in his pockets – he said I’d have been fine! Damn! I use a very sturdy little camera, an Olympus mju 720 SW which is shock- and waterproof and lives in my pocket. I think the photo quality is excellent as long as the light conditions are good, then the pictures are perfectly sharp and the colours are brilliant. It has its limits in dull weather, though (in that case I need to brighten up/sharpen the photos a bit to make them useable). In 2014 the shutter broke and stayed in a half-open position. At first I couldn’t find a place to have it repaired so I bought a new camera, an Olympus Tough TG 820. With that one I wasn’t happy at all, the photos seemed unsharp and the colours were unnatural (too intense). In the end I found a shop in England that specialises in Olympus repairs, and they not only fixed the broken shutter but also replaced the screen which had a crack in it and the metal casing which had quite a few scratches and dents. Now I’ve got my old camera back and it looks like new, and all for a very reasonable price. I’d be interested to know about that repair shop – where was it? Thanks for the camera info. Richard’s is an Olympus and takes much better photos than my Canon digi-camera but I don’t think it’s as good as yours. Anything would be an improvement on my Canon though – photos from that rarely make it onto my blog – only if I don’t have any other photo of something I want to illustrate! It’s Luton Camera Repair Service. Don’t be put off by the website design… their service is excellent and quick, would definitely recommend! Thanks. The website might not be as pretty as yours and mine but looks fine to me 😉 I wish I could still get someone who prints my films in store – even my local guy had to give it up as there weren’t enough orders so the chemicals weren’t lasting. 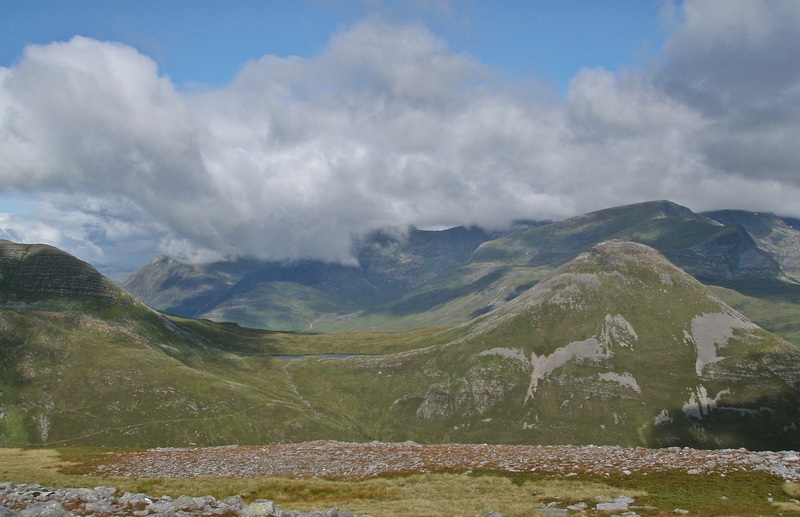 That last day is my favourite – not for photos but for memories – I really enjoyed that walk when I did it this summer (minus Aonach Mor which was too snowy in my opinion to go up on the day). Nice to see what the corrie looks like with no snow!